Hi again. 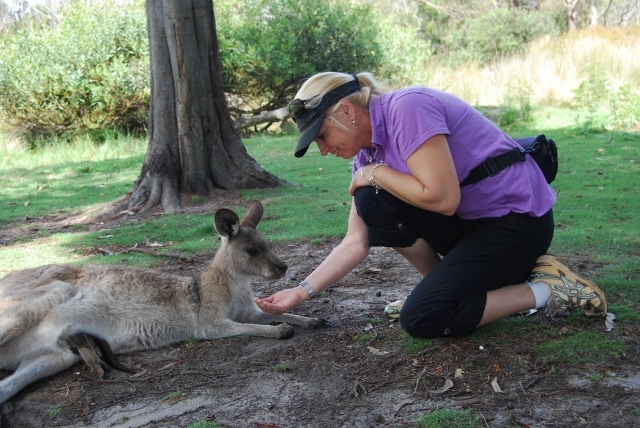 So what have we been up to in the land down, down under? As planned we stayed in Derby at the cafe for a few days before heading down to Hobart to meet with Tony (brother-in-law) and the yacht. We used the Derby time to get started on the schoolwork while I did a few odd jobs around the cafe; while Tony caught the bus to Hobart to get the boat sorted. Derby is a tiny little place that is on a major tourist road between Launceston and St. Helens. 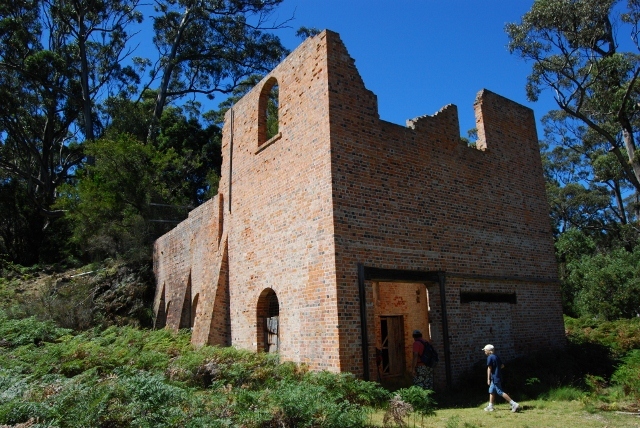 In its hey day it was a thriving town that was supported by a tin mine. There is a brand new and very flash 'Tin Mine Centre' that only recently opened that is well worth visiting (we have not seen it yet, but will on our way back). The town has two pubs, a small store, a mechanic, a few crafty shops and of course 'Berries Cafe'. There is also an excellent free camp on the river with a well maintained toilet block. The town now pretty much survives on the tourist trade, and that only lasts for a few months over the summer. 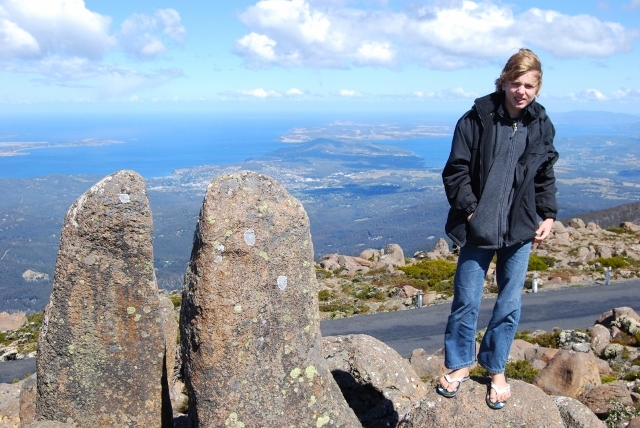 Tassie Tourism is trying to encourage tourists to visit over the winter months, but boy, you would have to be well set up for very chilly weather. So the boys did get a bit of schoolwork started but I am sure they spent most of the time sitting in the cafe having milkshakes, muffins and sampling all the other food. They were certainly getting very spoilt by their Auntie Anne. Friday we all piled in our car and headed to Hobart, only 200 kms but a 3.5 hours drive. As we were coming into Hobart Chris got a text from her cousin who is a radio DJ. 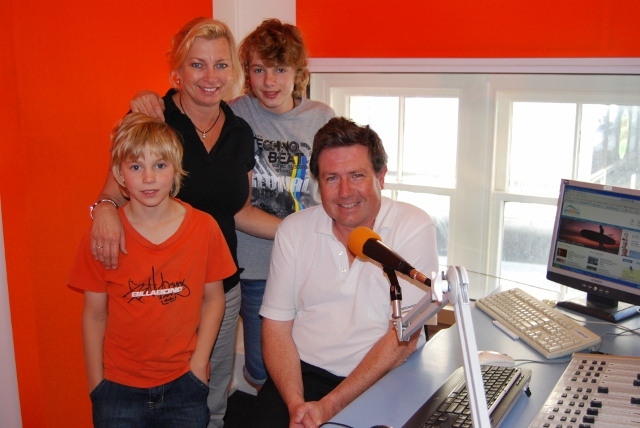 Next thing, over the radio came a 'Welcome to my two cousins, Anne and Chris who are visiting Hobart for a few days from Qld'. That is the sort of welcome we expect upon our arrival. The boys thought it was pretty special. 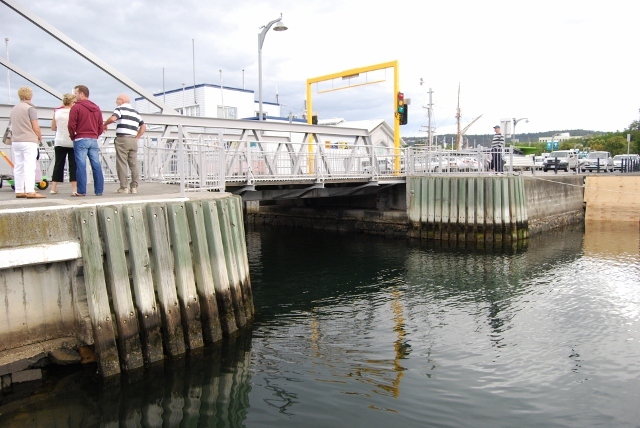 We made our way straight to Constitution Dock which is a part of Port Hobart. Now what a position this is! 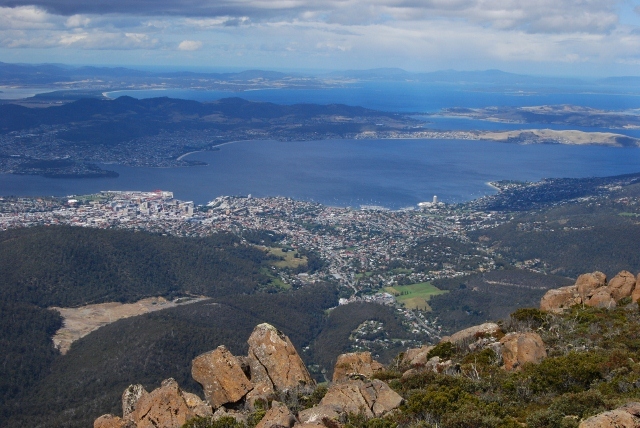 For those of you who have been to Hobart, you will be very familiar with this area. It is very much in the centre of the city and very much the central hub. The yacht was moored right next to the 1930 historic lifting bridge and across from Mures Seafood restaurant and only 300 metres from Salamanca Markets. There was a huge amount of walk-by traffic as this is a very popular spot in downtown Hobart. Drinks on the deck of 'Prime Time' at Constitution Dock. Saturday morning, us and almost the entire population of Hobart made their way to the Salamanca Markets. Chris and I came to Hobart when she was pregnant with Alex some 13 years ago. We only came for a week and visiting the markets is part of the trip I remember from back then. The markets now are much bigger and now also have a lot of fresh produce which is nice. I do confess to being a bit of a market junkie and enjoyed the few hours we spent looking at the crafts for sale. I am pleased to say we bought very little except for some local produce and a new lap top bag for the princely sum of $10-00. Bargain. We had coffee, lunch and sat around and watched all the beautiful people walk by. Harry's boat tours around the dock - only 50 cents a ride. What a bargain! After walking all day we then headed off on foot to Battery Point to a favourite restaurant of Anne and Tony's, Magic Curry. Lovely authentic Indian food and good service. If in Hobart, they are worth a shot. As we walked home, into a coffee shop for an ice-cream and then back to the boat for a night cap. 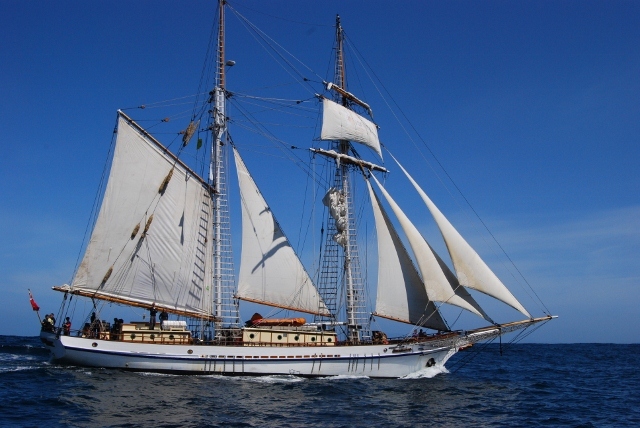 The boat is a 36 ft steel motor sailer. It has a mid-raised pilot house/ lounge area. It has an aft cabin (double bed) and a forward cabin consisting of two beds, galley and bathroom. There is plenty of storage and nice large outside decks both fore and aft. There was plenty of room for the five of us without getting under each other's feet. Engine repairs on the 90 HP Perkins Diesel - that looks fun, not. The next few days were rather busy. 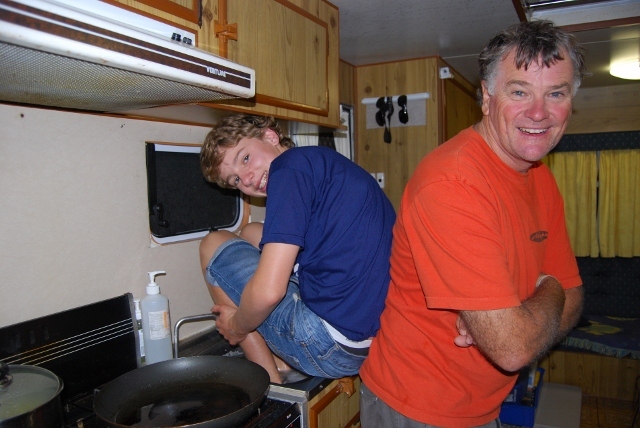 For the past few weeks Tony has been having a few engine troubles with the boat. It started when he had trouble getting the engine to turn over. He first thought it was the batteries or battery connections. Then he thought it may be the starter motor, so removed it, had it checked but all OK. Then he noticed water in the oil, and lots of it. In fact he pumped out well over 15 litres from the sump instead of the 8 litres there should be. I rang a few marine engineers in Hobart and one came around and pulled out the oil cooler as it was the most likely suspect. 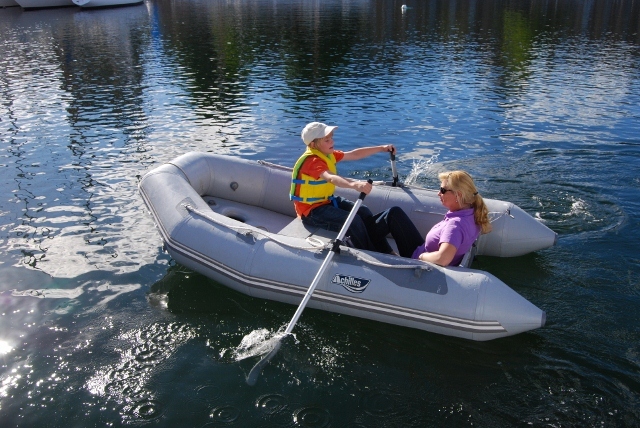 The motor in this boat is a 90 hp Perkins diesel with a fresh water cooling system and a salt water heat exchange. The oil cooler is surrounded by salt water as the cooling source and they often get a leak so salt water can leak into the engine and mix with the oil. It was OK and they had no more ideas so ditched us. They recommended another guy who we rang and he came straight around. It was now Tuesday and we had to be out of the marina by Wednesday for the huge Wooden Boat Festival, due to start on the weekend, but lots of setting up beforehand. The organisers came around and we told them our problem and they said they would have to tow us out. Great! The new fella was pretty good and it was not too long before we had discovered the problem. The salt water was syphoning into the exhaust from the salt water intake, filling it up and then flowing into the exhaust manifold and into the cylinder head and draining down into the sump. Tony is so lucky he didn't bend a con rod or even worse. 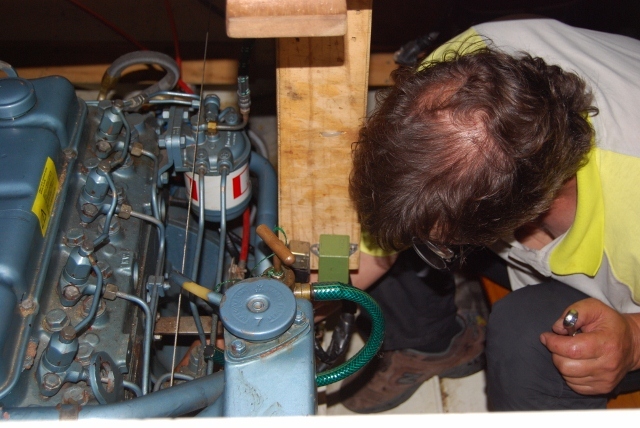 The mechanic put a non-return valve and a high loop in the salt water system and the problem was solved. We did a few more oil changes and finally got the oil back to being clear again. That of course meant we could motor out of the marina and not be towed. 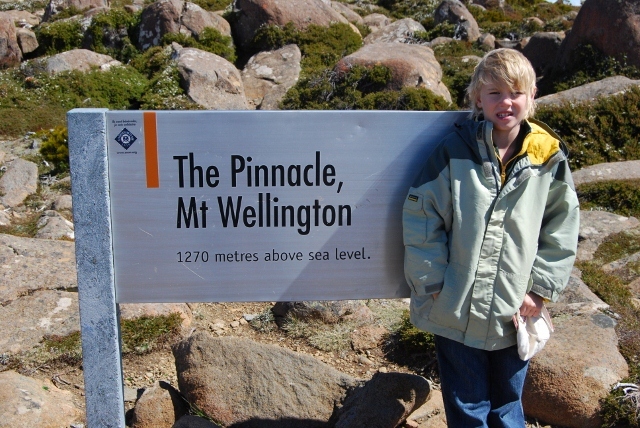 Our last few days in Hobart were spent doing a bit of shopping, visiting Mt. 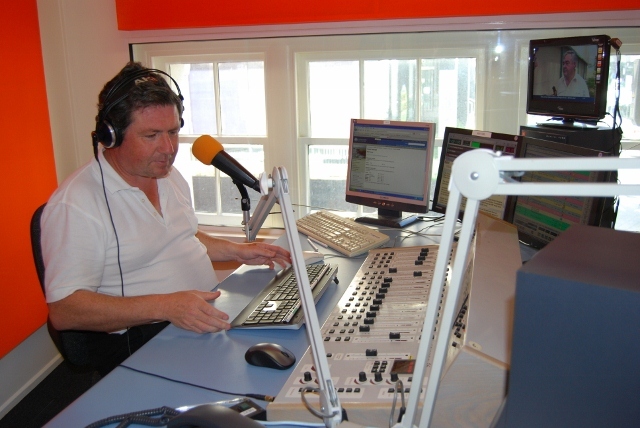 Wellington, Chris cleaning out the galley, doing the museum over and visiting David's (Chris's cousin) radio station. It was very interesting. 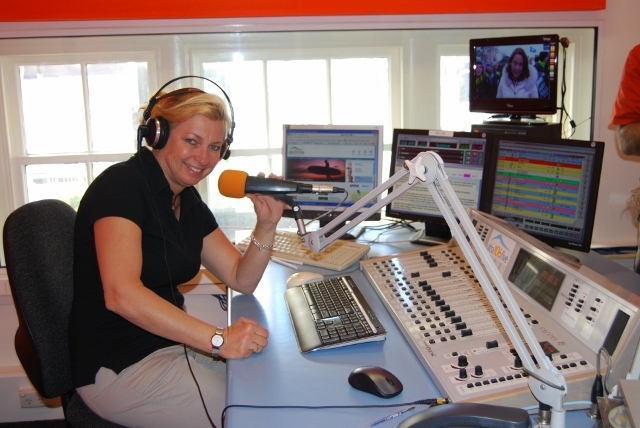 106.5 Ultra FM - their new DJ's. Sorry, and their old one, David!! Mt. Wellington - absolutely freezing, but what a view. Down the track we will be back in Hobart in the van and will stay with David and his wife Clare. 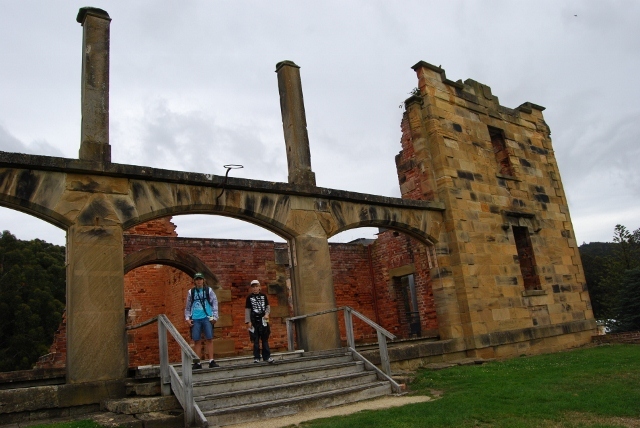 So Wednesday we headed off early morning and sailed to Port Arthur. It was a 60 km sail across Storm Bay (aptly named) which was as rough as, probably around a 6 metre swell. While no-one vomited we did feel somewhat unwell for a few hours. Chris and Harry lay on the couch for the duration not daring to move! They did manage to peer out of the window every so often to take in the spectacular scenery, especially rounding Cape Raoul. 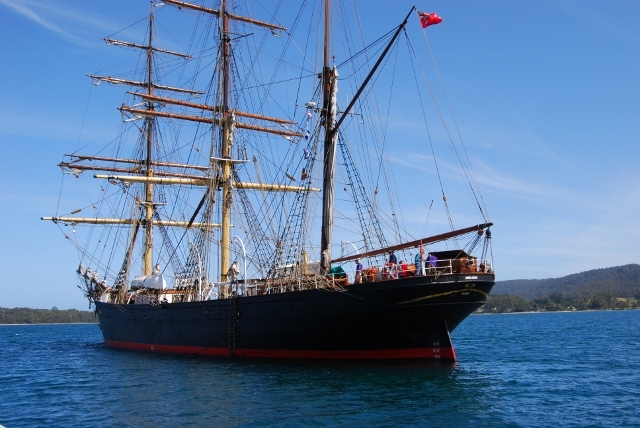 On our way across the bay we passed a very large square rigger that was on its way to Hobart for the Wooden Boat Festival. 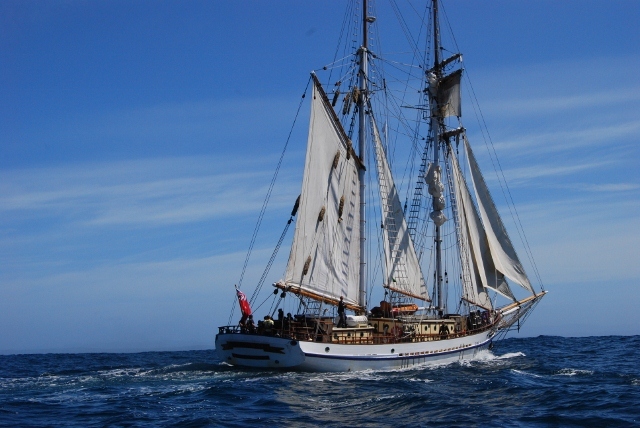 It looked amazing, all its sails up looking so proud on the open seas. We said to Tony to sail close so we could get a good view. Well, he sailed so close we could not get it all in the picture. In fact we were so close we could talk to the crew! 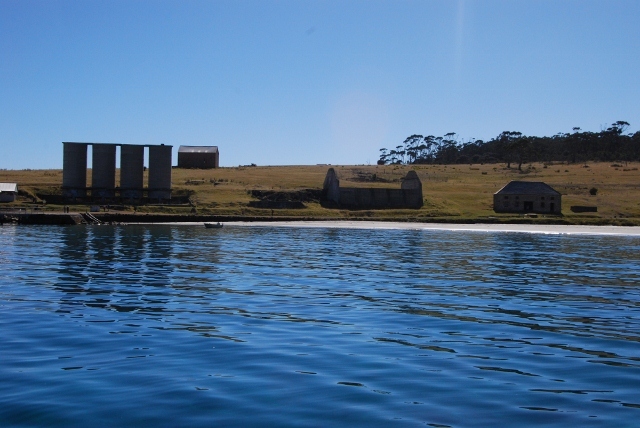 Then it was into Port Arthur where we anchored with the ruins of the penal colony in the background. 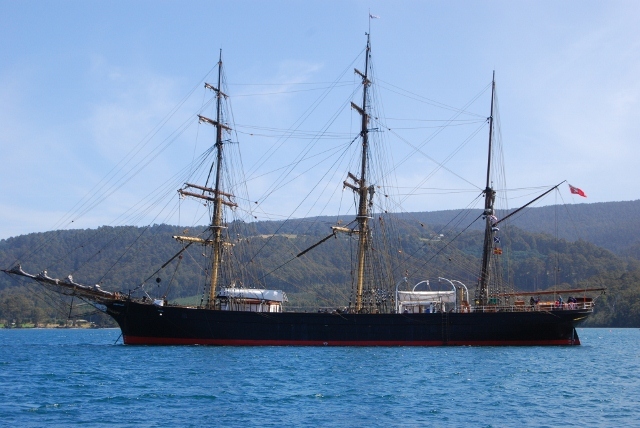 There was also another tall ship moored there called the 'James Craig' which is a well known ship (the last two photos above). What a perfect night. The tall ship lit up like a Christmas tree and Port Arthur behind. Can it actually get any better than this? 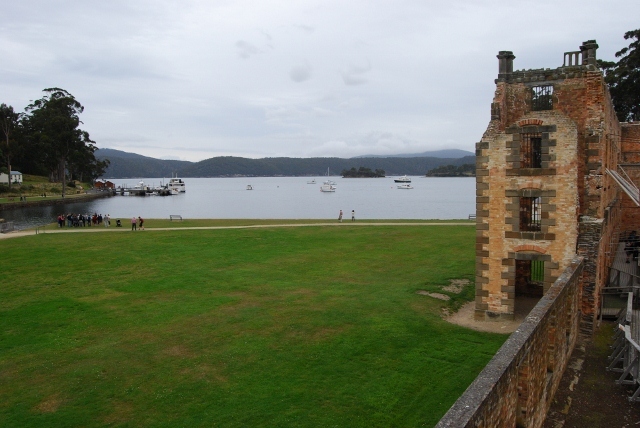 Next morning we went ashore and spent the day exploring the famous Port Arthur. We did the tour, the boat trip and listened to the audio commentary. There have been many changes since we last visited including a new information centre. We had a great day and only saw about 1/2 so we will be back in the van in the next few weeks. We ended up buying a 2 year pass for an extra $12-00 per family so we can visit again for free. 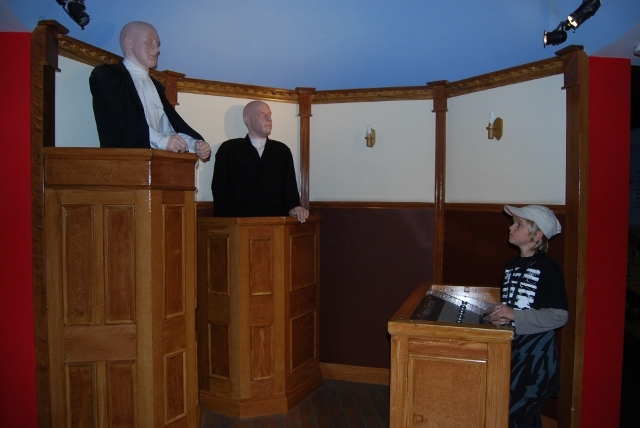 The boys were fascinated by how harsh things were in the "Good Old Days". In England at age 4 years children could be working 12 hours a day as chimney sweeps or messengers, age 7 they were classed as an adult and could be tried for crimes and age 8 years they could be transported to a penal colony. At age 9 years they could be hung for crimes committed. They really were the 'Good Old Days', and the kids today think they have it tough. 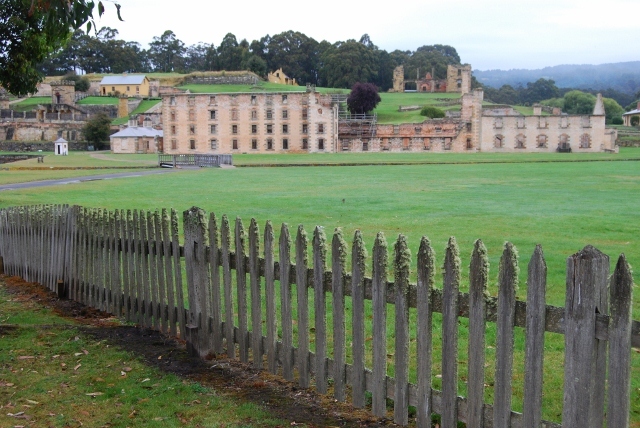 Port Arthur - looks nice and peaceful now. Not sure it was back then. 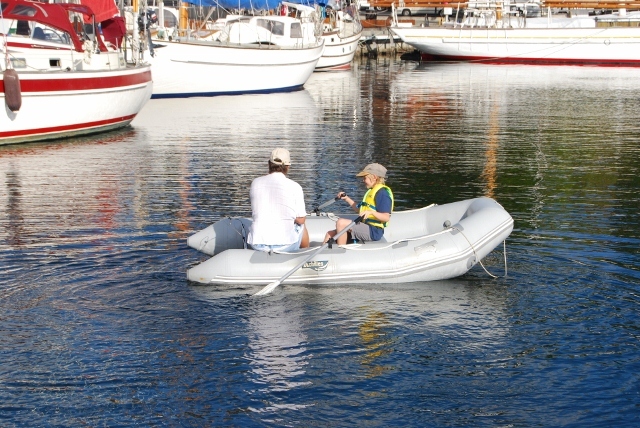 Late in the arvo it was back to the boat; we all put in a line and sat back to take in the ambience. Well that didn't last long. 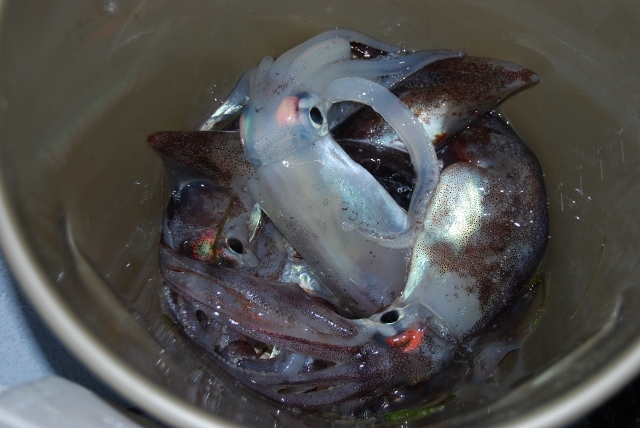 Next thing the fish started to bite, as did the squid. 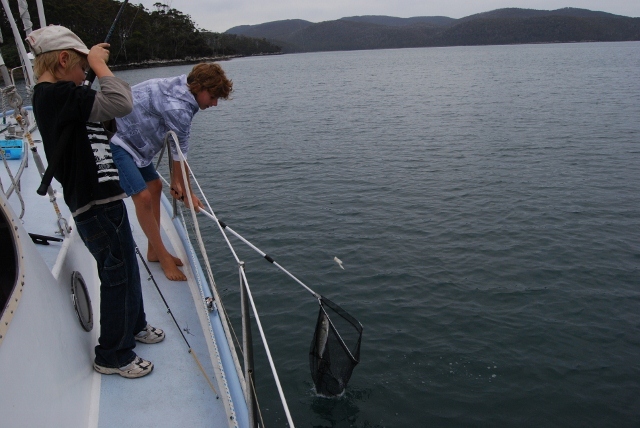 We didn't have squid jigs so we were teasing them to the surface and then carefully getting a landing net under them. 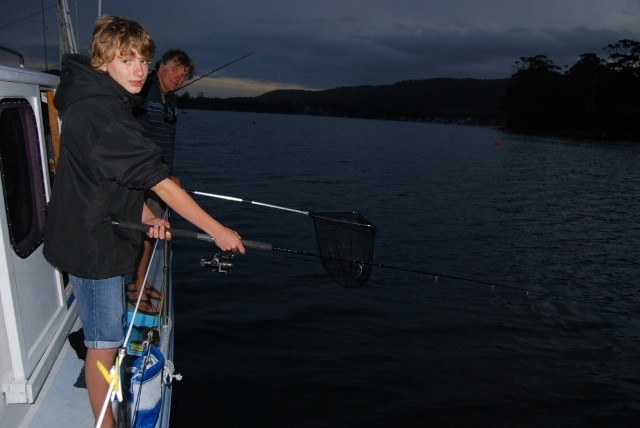 The boys managed to land four good size squid, as well as flathead, salmon and spotted Trevalla. Looks like it will be fish and chips for dinner tomorrow night! 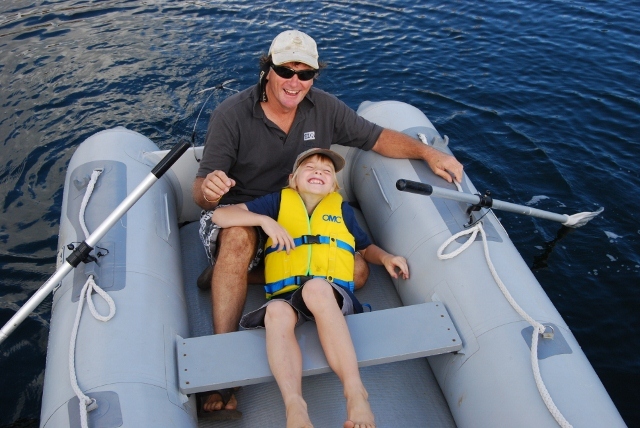 Harry was very excited as it was his goal to at least catch one edible fish while on the boat. He well and truly achieved that. 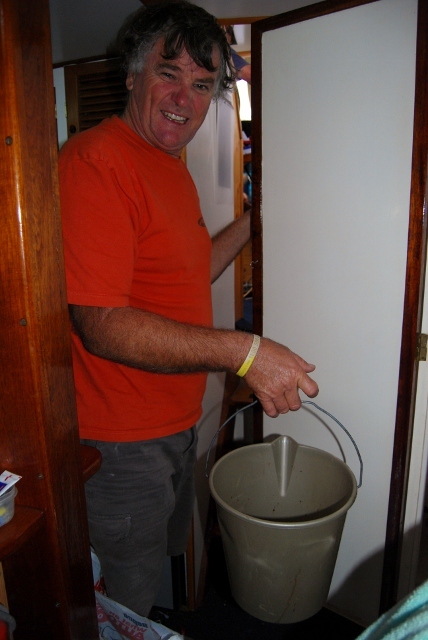 Our next mechanical issue on the boat was the toilet. I had just finished my morning ablution and tried to flush the toilet but - dunny blocked! I was then given the title 'Iron Turd'. The rule of the sea apparently is - you block it, you fix it. Charming. So here I am, in the bathroom, bailing out turds and dirty toilet water with an ice cream bucket and emptying it overboard. Then I had my hand, yes no glove, down the crapper trying to dislodge the offending iron turd. The bowl refilled, and again I had to bail it out. I am never going to crap again!!!! It looked like I was going to have to pull the macerator apart and clean it out. Sensational. 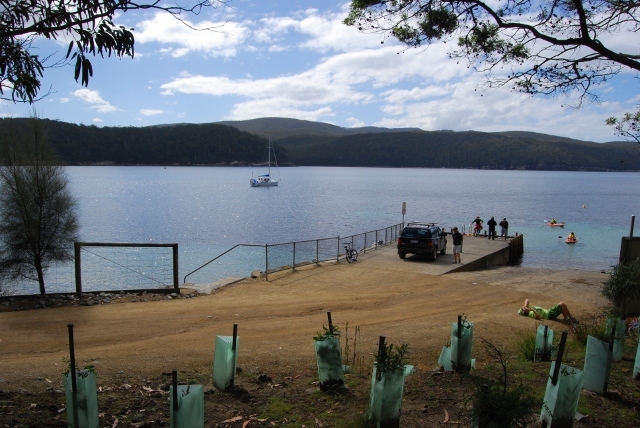 Next morning we pulled into the public jetty at Port Arthur to get rid of the rubbish and fill up the water tanks. I then had the bright idea of sticking the hose down the dunny and flushing it out. Well that didn't work. The bowl filled and again I had to bail it out, now with 24 hr old turds floating around. It's getting worse! Again I tried and again the bowl filled. Give me strength! Last try and the macerator sputtered and spurted and started to pump out. There is a god. I have been spared. 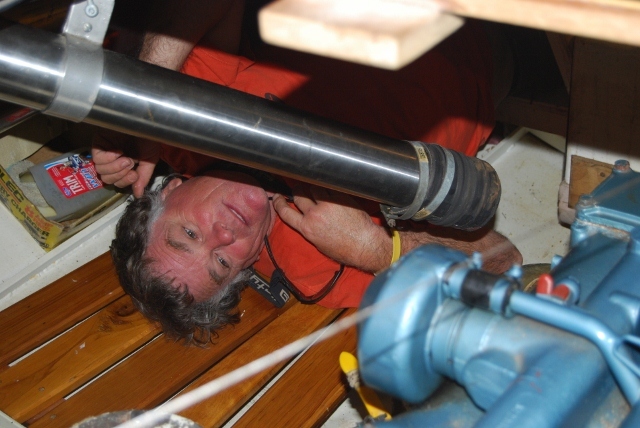 Toilet issues dispensed with and then we had anchor winch problems. The winch would pull up the anchor but we couldn't get the anchor down. Tony and I pulled the winch apart while having a few red wines and finally worked out and discovered the problem and were able to fix it. Let me tell you it was more fun than the toilet debarkle. 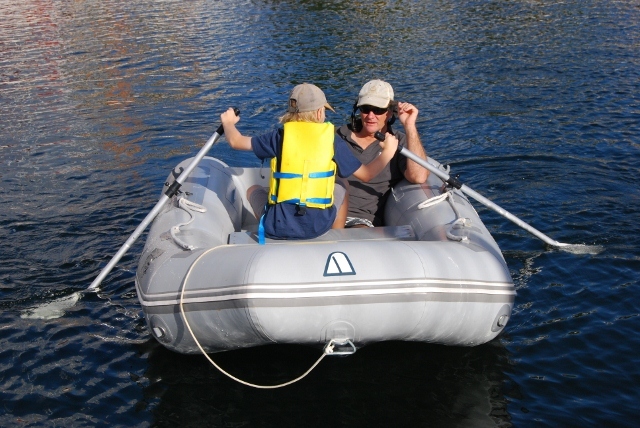 Next to cause us grief was the little 2.5 hp outboard on the rubber inflatable tender. We snapped a shear pin in the prop and of course didn't have a spare so we had to fashion one out of a split pin, until we could buy the real thing. 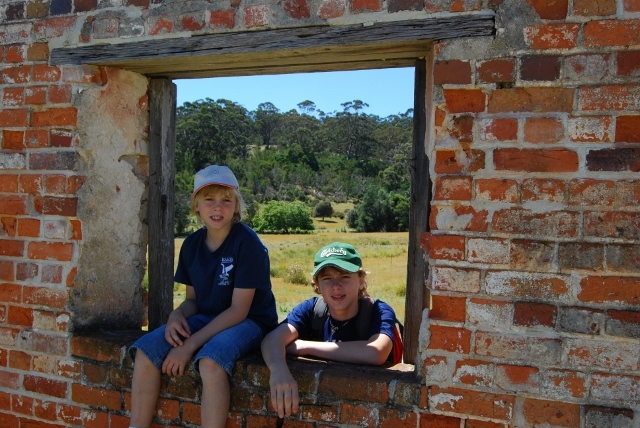 We left Port Arthur and sailed around the corner to an anchorage called Stinky Bay, near the 'Fox and Hound' Hotel for a schoolwork day. Tony and I walked a few kms back to the little township of Port Arthur and grabbed a few groceries that we needed and on the way back collected a kilo of blackberries from a bush on the side of the road. They were magnificent, so sweet. 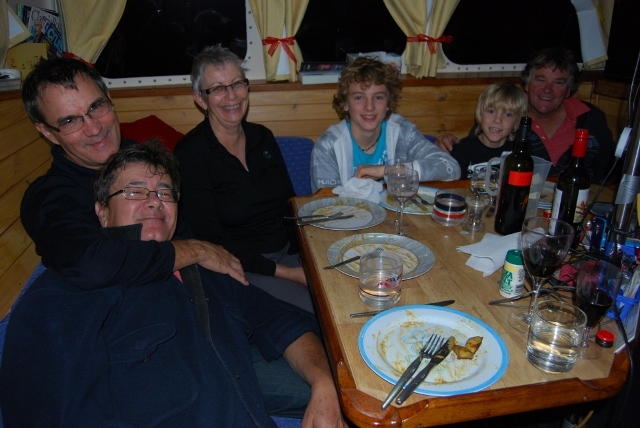 Tony had some friends, Ian and Margaret from NSW who just happened to be in the area so they came down to the boat for dinner. Ian and Margaret visiting - Great lunch. Thank you! 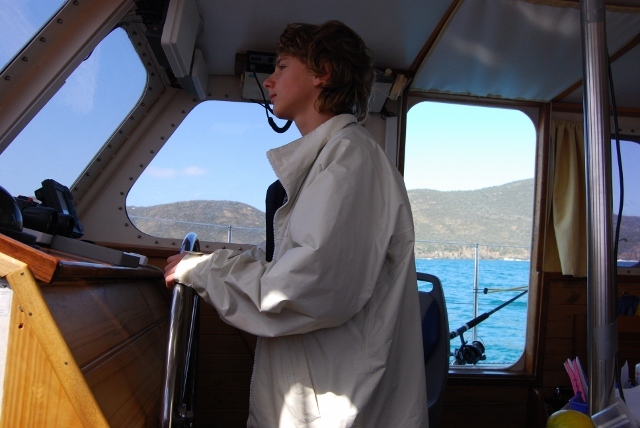 Next day we sailed back out into Storm Bay (even bigger seas than a few days previous for about an hour or more - Chris was not happy) then between Tasman Island and Cape Pillar. We then sailed across Munroe Bight in much better conditions, sighting 'The Lanterns', rock formations including the Totem Pole and Candlestick (which people actually rock climb - mad buggers!) to Fortescue Bay. Ian joined us for this leg while Margaret kindly went and bought lunch for us all and then met us at the boat ramp/national park campground. She can come to lunch anytime. We had the most gourmet of all gourmet lunches. 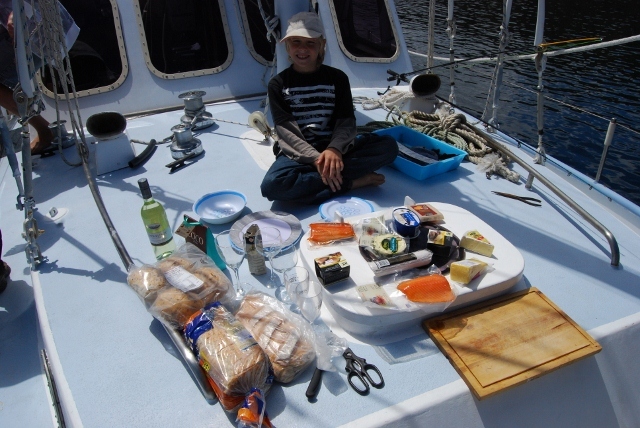 Smoked salmon, smoked trout, every cheese known to man, pates, breads, biscuits and wine. What an absolute feast in the most beautiful bay you could imagine. Thanks guys. While we were taking Ian and Margaret back to the shore we chatted to a diver who was just getting out of the water. He was a recreational diver looking for abalone and crayfish. Tony offered to take him in the yacht out to some deeper water, an offer he took up. He scored a few cray and abalone and gave us an abalone to cook up. We have had them before and while they are just OK, you would have to wonder why they are worth so much when exported OS. We then motored 10 minutes to Canoe Bay which is a protected anchorage tucked in behind an old shipwreck. 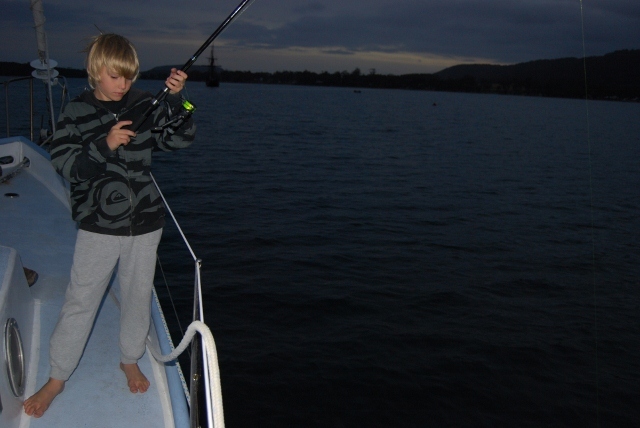 Harry again went mad catching salmon that were flying all over the boat. Harry has an interesting technique for landing fish. He yanks on the rod and catapults them out of the water with much speed - splat, onto the deck, roof, window or mast of the boat. That will be breakfast in the morning. Sunday morning and we ducked around the corner back to Fortescue Bay as I wanted to talk to the rangers about the campground and to buy an annual national parks pass. They have a similar system to WA with their parks pass. At $96-00 it's not bad value when you consider they charge $24-00 per vehicle per day entry to any national park. 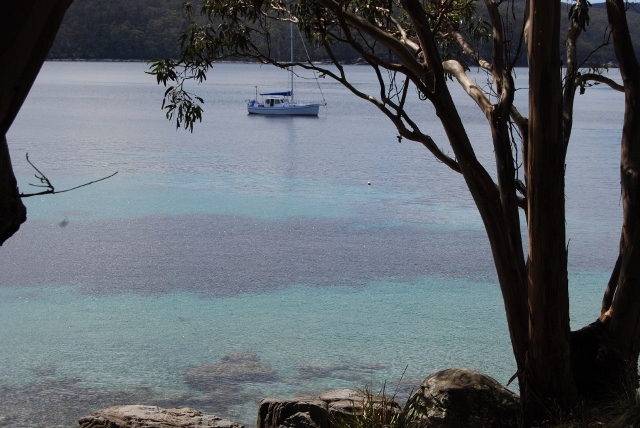 I also got a pass for the boat (all included for the same price) which will be handy as we were heading to Maria (pronounced Mariah) Island and Wineglass Bay that are both national parks and require an annual permit or payment. 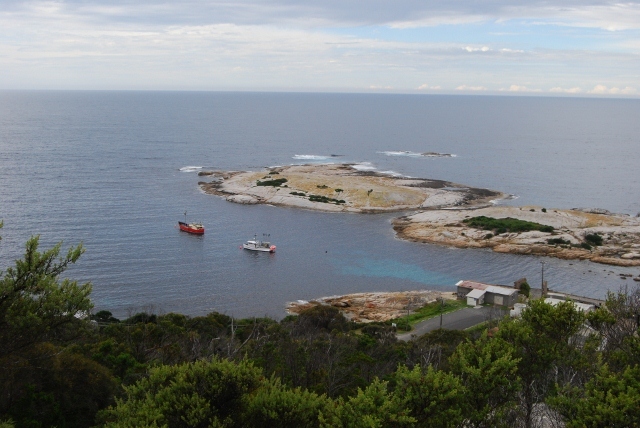 We then moved on for another 60 km day arriving at Maria Island and moored for the night at Riedle Bay. It was an interesting sail with plenty of wildlife to be seen. We saw a colony of seals on a rock ledge, then a huge pod of dolphins, maybe as many as 50-100. Every so often a dozen or so would break away and surf the waves of our bow. They came and went for about 30 minutes which very much kept us entertained. They really are a beautiful, gentle and graceful creature of the sea. Every so often on the trip we would spot the odd seal, laying on its back, floating along with a fish in its fins. 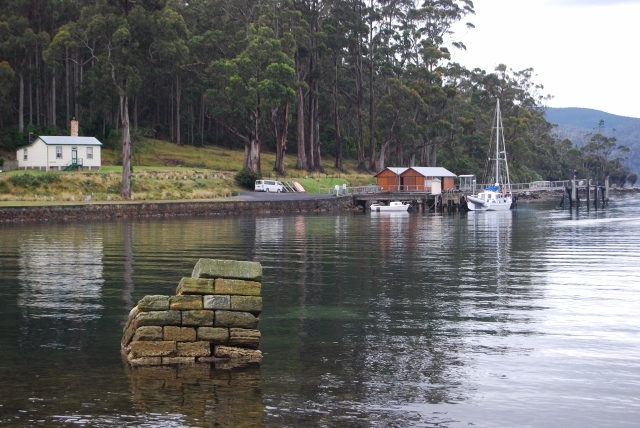 The next morning we sailed around the corner and moored in a small bay at the old township of Darlington on the northern end of Maria to explore the remains of the penal settlement that was used at the same time as Port Arthur. This is a much smaller turn-out than Port Arthur but still very impressive. As long as you have a national parks pass it is completely free. This is a small island that has a very interesting past. 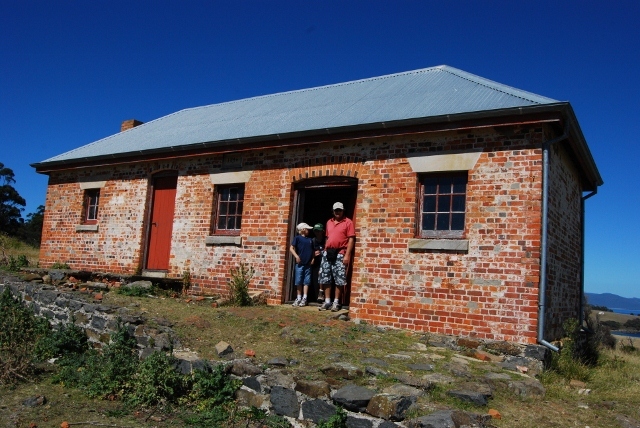 Maria Island started as a convict penal colony in 1825 and closed in 1832. For the next ten years it was used for lots of reasons, none of which proved very successful. 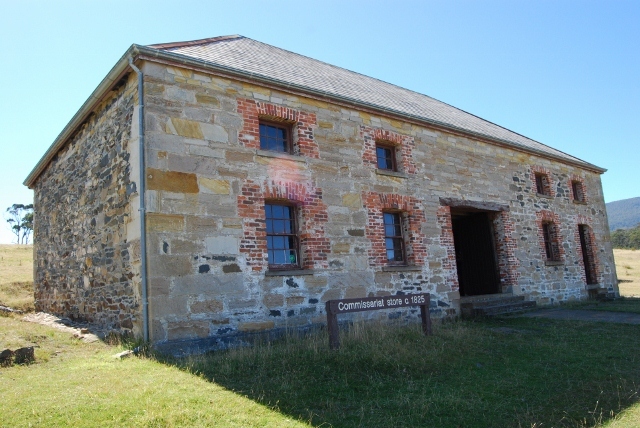 It re-opened again as a convict penal colony in 1842 and closed permanently in 1850. In 1852 it was used for grazing before an Italian, Diego Bernacchi leased the land (for 10 cents a year) and planned to make wine, silk and cement. Grapes by the acre grew well on the island, but by the end of the century his empire began to falter until all production ceased. The island reverted to a small fishing community and Darlington became a rustic retreat for a few holiday makers. 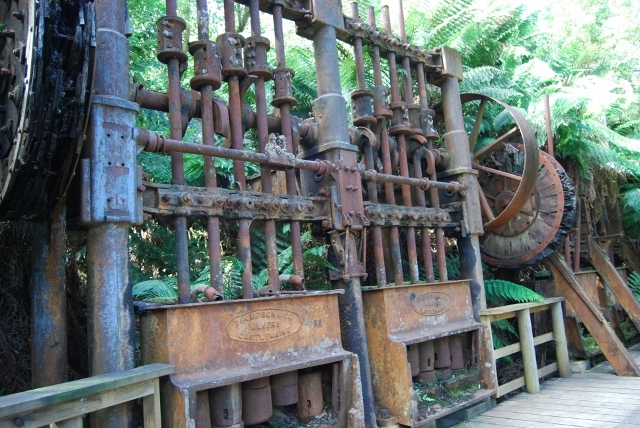 After World War 1 the timber milling industry began and the cement production re-commenced, and the population on the island increased to 500. In the 1960’s the Government bought back the land and turned it into a national park. 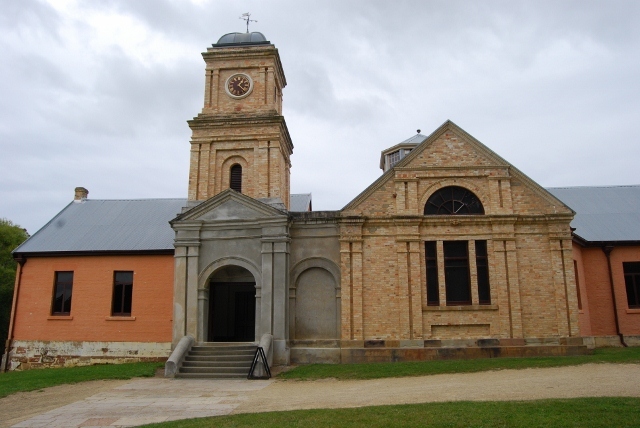 Many of the original buildings have been beautifully preserved and some restored to their original state. 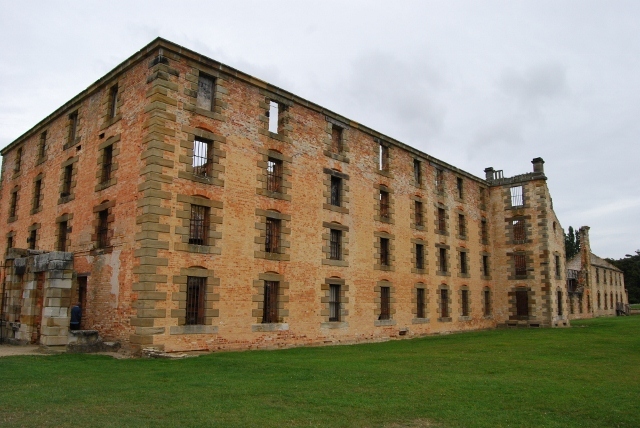 You can actually go and stay in one of the penitentiary rooms for $50-00 a family per night. No power, a wood stove and possibly a few ghostly stories to be told, but nice, comfortable beds supplied. We spent the day walking around, reading all the info and sitting in the old Coffee Palace listening to an audio from the late 1800's. 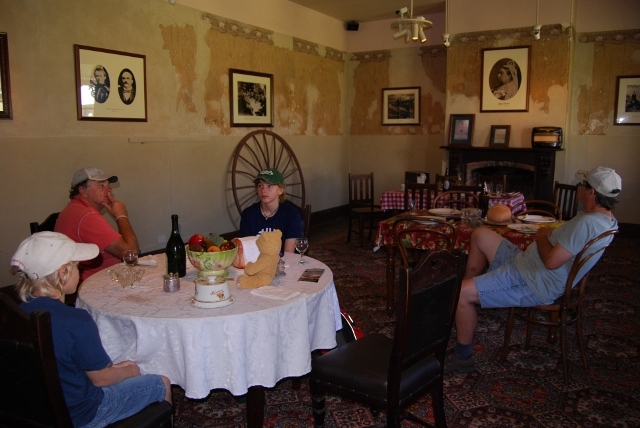 If you closed your eyes and occasionally glanced around the beautifully preserved dining room you found yourself shifting back in time, and really feeling a part of the era.We even had a geology lesson with some fossilised cliffs, showing many shells and rocks embedded within. The sky was clear, it was warm and the water the most beautiful turquoise blue. A fantastic day out. Late afternoon we pulled up anchor and motored a few miles towards the mainland to Triabunna, which is a very quaint seaside coastal town. We rafted up next to a crayboat at the wharf and refuelled, filled up with fresh water and recharged all the batteries with shore power. We found a laundromat and did a load of washing while having a coffee across the road at the bakery. This is the life. Then we were walking past the hotel (now we are talking a tiny town, 5 shops, one pub and a servo) and Chris yells out and runs into the public bar. Well bugger me. Chris glanced in the bar, saw Melody (works at the same school as Chris in Bundaberg) and her husband Neil (who works at the same hospital in Bundy that I did). Now tell me, what is the chance of that. We chatted to them for a while and then headed back to the boat. It really is a very small world. 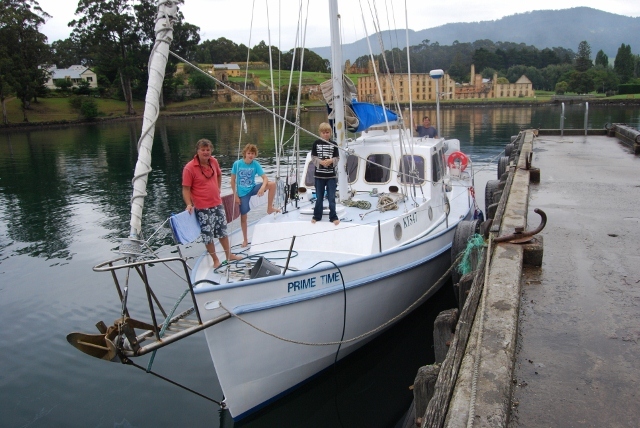 Next morning (Tuesday 15th) we left the Triabunna marina and headed north into a northerly wind that was reasonably unpleasant to Freycinet National Park. 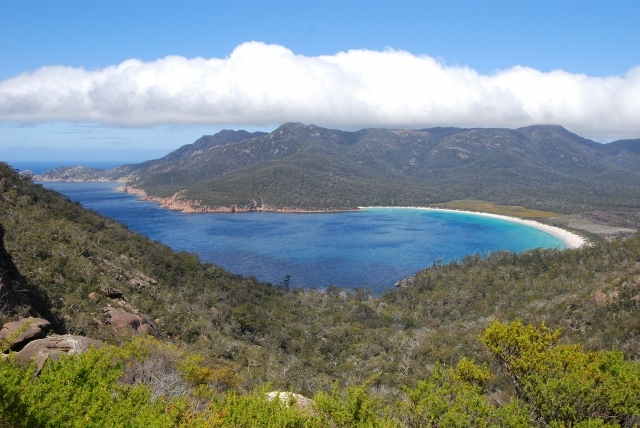 We had originally planned to make it to Wineglass Bay but instead pulled up stumps at Brian's Corner (around the other side of the peninsular) as it was nearing 'wine o'clock'. This was not the most protected of anchorages and we did rock and roll a bit throughout the night. 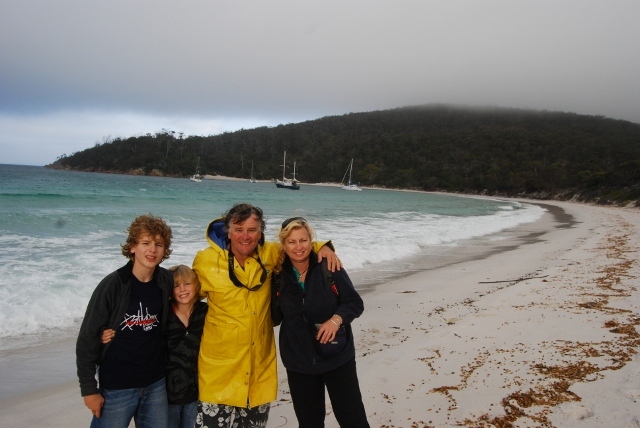 Next morning we were up nice and early to head to Wineglass Bay. We thought the sail was going to be relatively calm but it turned out being a rather nasty N/E which resulted in a very sloppy unpleasant swell. 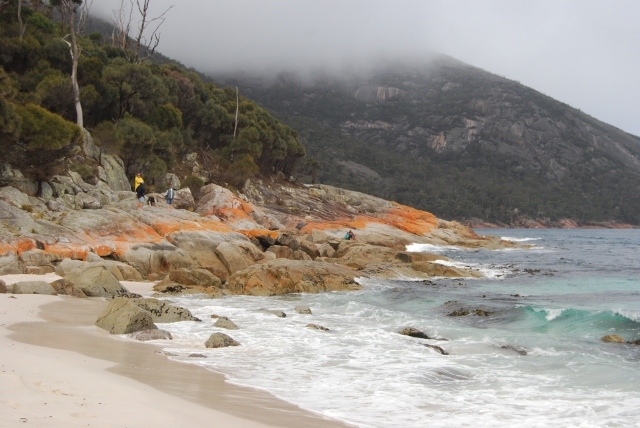 Chris really did not enjoy it (scared not sick) and we pulled into a very cloudy, rainy, choppy, brown and rough Wineglass Bay. Believe me it looked nothing like all the pictures. We got off the boat between showers and walked along the beach. Now here is a strange feeling. 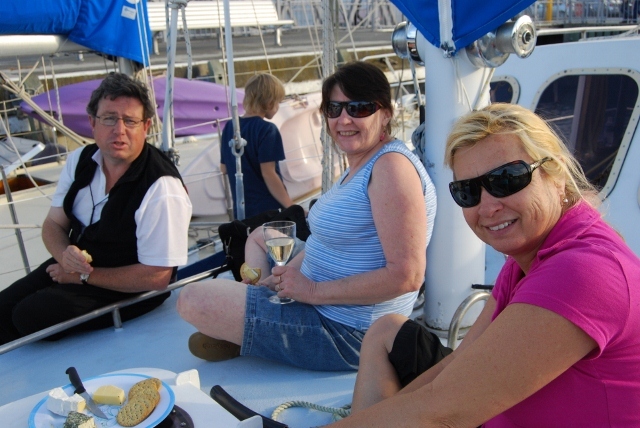 As we have been on the boat now for two weeks we have all become very accustomed to the rolling and rocking. Now even in unpleasant seas we have not been getting sick, until we get back on the land. Then we suffered 'land sickness' where we actually felt nauseated from being on the land. It's like a reverse sea sickness. Most bizarre. The next step to complete our trip is a 12 hour sail from Wineglass to St. Helens. The weather was looking OK so we planned to head off early Friday. Chris was not so keen so planned for her sister Anne to drive down and pick up her and Harry. Then Alex had second thoughts about the long sail so he also decided to go home by car. Tony was a bit worried as Alex has been his number one crew. How are we going to get the sails up now?? Thursday we woke to a very heavy sea fog which lifted to a beautiful sunny day, bay flat and that magnificent turquoise blue you see in the photos. 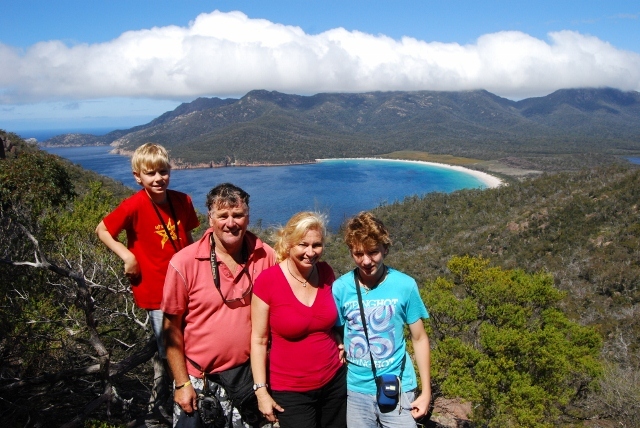 The walk to the lookout over Wineglass Bay took about an hour and then Chris and the boys walked off towards the carpark to meet Anne. It was a pretty tough steep uphill walk and while it is pretty, I didn't think it was as good as I had expected. It was a little overcast by the time we made it to the lookout so I will have to reserve my judgement until I see it one day in full sun. We will be revisiting here in a few weeks on our way down the coast in the caravan as there are a few other bits we are yet to see. There will be a few photos then, hopefully with the sun shining. 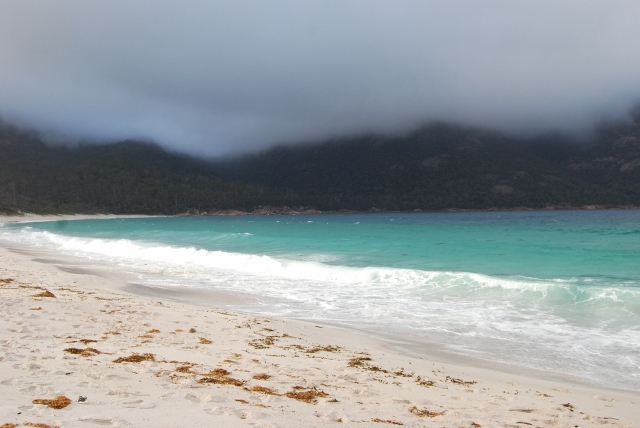 Wineglass Bay at it's worst. Hope it is better in a few weeks time! 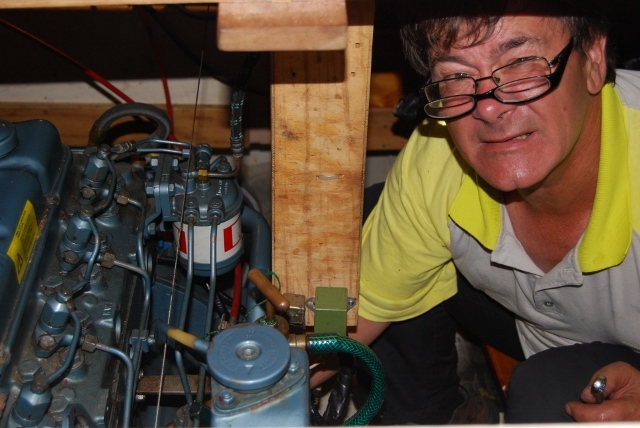 It was back to the boat for me to do a bit of engine maintenance with Tony; fuel filters, grease the prop shaft etc. before heading off for the 12 hr slog first thing Friday morning. 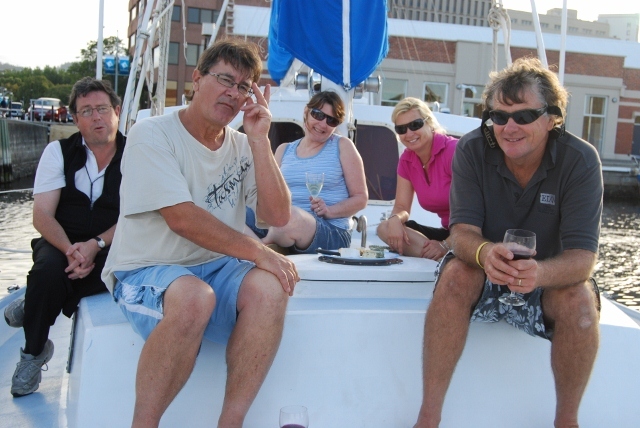 We were tossing up whether to do a night sail on Thursday night or go with the original Friday day sail plan. 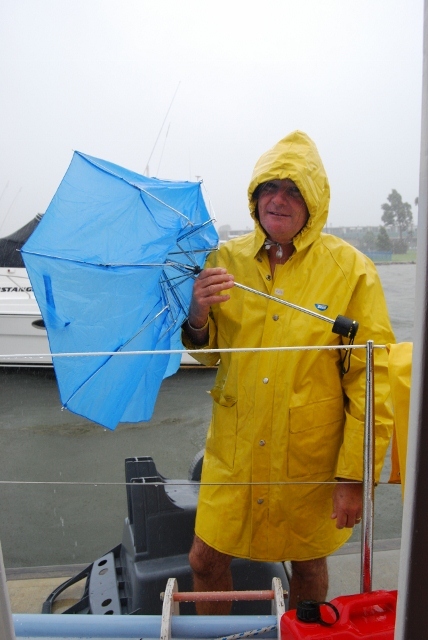 The winds looked better (S/E) for Friday so at 0400 I was up preparing the boat (as all good crew members do!! Actually a mozzie woke me and I couldn't get back to sleep) and we set sail before sun-up for the 52 nautical miles (100 kms) averaging about 7 knots for the entire trip. The wind was as expected and the sea not too bad so we made good time. We arrived at the St. Helens bar at 1400 which was unfortunately getting on for low tide and there were waves crashing over the bar. It was not a pretty sight. Shortly after we arrived two large power cruisers arrived (about 45 ft each) with one deciding to sit it out for a few hours and wait for a bit more water with the other giving it a go. Well half way across the bar he hit bottom and stopped. Luckily a big wave came through and hit him straight on the stern and pushed him forward into slightly deeper water. At that stage we chose also to sit it out. The swell was large and we bounced around like a cork which was annoying as it was so hard to do anything except have a snooze, which I did. At about 1700 we upped anchor and in we went, complete with life jackets on (the law states you must wear life jackets for all bar crossings, but let me tell you it does not fill you with confidence when you are handed one). We set off into the swell and chop, sat on the edge of no return and waited a few minutes for a break in the sets of waves and off we went. The old Perkins was flat out as we surfed down one wave with another chasing us from behind. 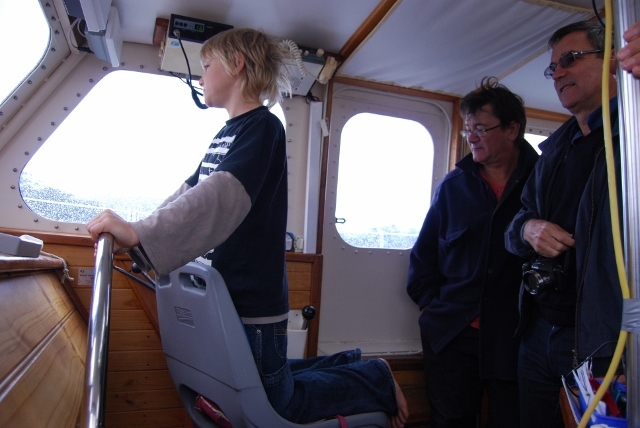 Luckily it was all over in a few minutes with us safely over and in smooth waters. We did hit bottom on the way down the channel to the marina, but managed to plough our way through, cleaning the barnicles off the keel on the way through. 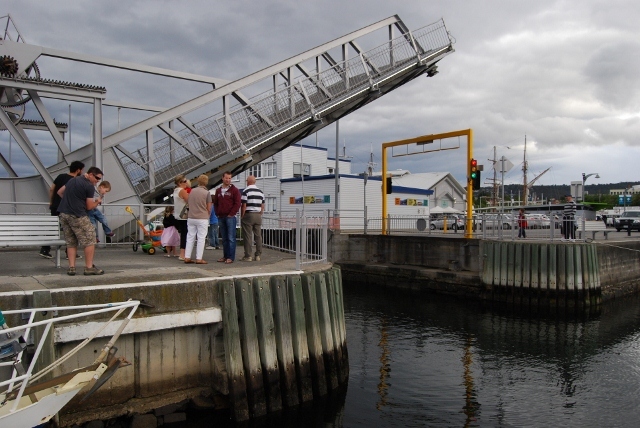 St. Helens is another pretty seaside town with the marina almost the focus of the town. We pulled into Tony's berth at the floating marina and tied off 'Prime Time' for the last time. We have been on board exactly two weeks. The trip has been absolutely brilliant and a great opportunity for all of us. While the boat is not huge (36 ft) it is comfortable and considering we were actually on the boat most of the time, there were no issues. 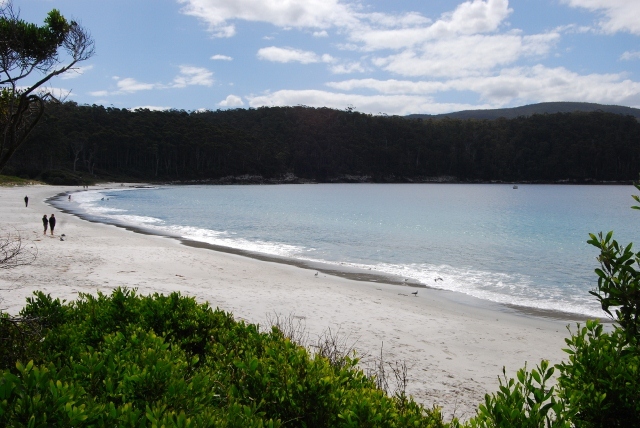 To see the east coast of Tasmania from the ocean is certainly not something many get to see. There were so many special times it is hard to narrow them down to just a few. We loved sitting on the boat at Constitution Dock, watching the world go by, sailing into Port Arthur was special, as was Maria Island. The cliffs and rock formations along the way were breathtaking. Fortescue Bay, having a pod of dolphins playing at the bow of the boat and passing tall ships on their way to Hobart for the Wooden Boat Festival are things we will all remember. Was there any negatives I hear you mumble? No, not one except the sail had to come to an end. No-one got sick and we all adapted to life at sea better than I thought. Friday night after securing the boat we headed across the road to the pub for dinner and then back to watch some AFL (NAB Cup) before hitting the sack. Saturday was pack-up and get off and clean up the boat day, followed by the markets and the drive back to Derby and the caravan. Well that didn't quite go to plan. We woke Saturday to rain, and a lot of it. In fact it rained so much that St. Helens actually flooded. The main street was closed, shops inundated and fire trucks were there trying to pump out the water. As you can see from the photo it was somewhat miserable. To make it worse the car was parked what seemed to be miles from the boat. I did about 20 trips back and forth until the car was fully packed and then, the rain stopped. You would have to be joking!!! As wet as ten shags we all got in the car for the hour trip back to Derby and our little caravan. I must say it was good to be back in the van, our own bed and space. The boat trip had been absolutely sensational and we felt sad that it had come to an end. We would all love to do something like it again in the future. I would even consider buying a boat like Tony's. I can just see us, six months in the van, six months in the boat. And you think I am joking! We all worked fairly hard when we got back to Derby, washing clothes, unpacking and repacking. We planned to move on the next day otherwise another day would slip by and we only have a month or two of good weather ahead of us. 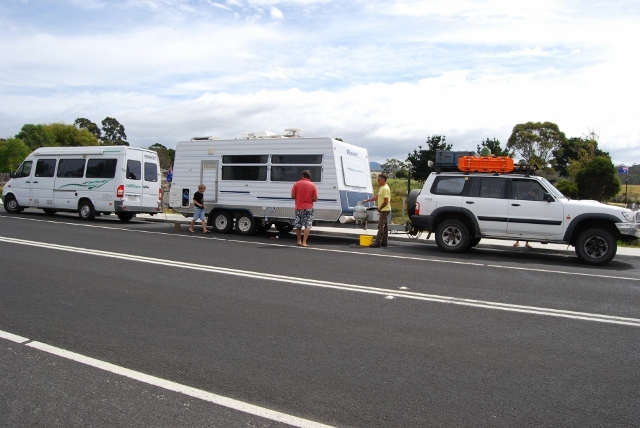 Sunday and the beginning of our fourth week in Tasmania saw us finally packed up and moving on from Derby. 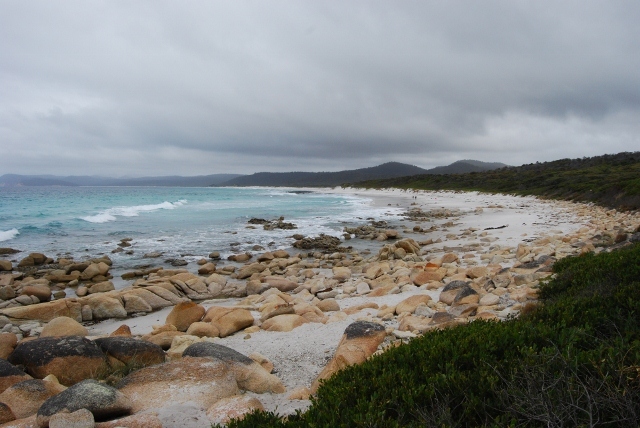 We actually didn't get away until about 1430 and only planned a quick trip back to St. Helens to have a good look around and then up to the Bay of Fires. Now let me tell you a funny story. When we were leaving the boat on Saturday Chris brought out two Coles plastic bags full of rubbish. Next to them she placed another Coles plastic bag full of fresh fruit and veg (to be kept) and an abalone shell that we had collected from Fortescue Bay that I had spent ages cleaning all the gunk off. So I picked up all the bags, assuming they were all rubbish (as I had been not been told differently, although I am told I was!!! He was - Ed) and took them all off to the rubbish bin. When we got back to the van Chris was running around looking for this bag of food, finally working out what had happened. She was most concerned about losing the abalone shell, not the $30-00 worth of fruit and veg that met its demise. So on Sunday, when we arrived in St. Helens we thought we would go to the bin (at the marina) and see if we could recover the shell. I parked the van so we could not be seen from the street (or so I thought) and we started pulling rubbish bags out of the bin and piling it up on the ground until I pulled out a bag full of revolting, foul smelling meat. I jumped back and looked around to see a police car that had pulled up and two cops watching us. We quickly put all the bags back in the bin, washed our hands and did a quick exit, stage left. 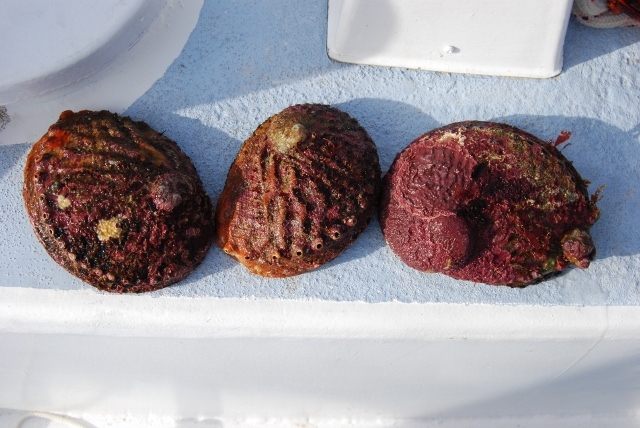 Sad part is we were almost down to the bag so still have no abalone shell. We did get a good laugh about it later. After the bin episode, we snuck into the local IGA hoping we wouldn't be identified. We grabbed some replacement fruit and veg and headed off to one of the many free camps around the town. Now there is a huge choice here. 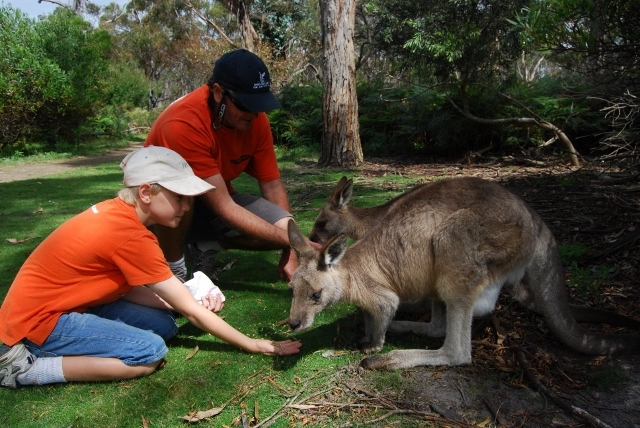 You can stay in the park in the middle of town or head out only a few kms to the first of about six coastal reserves. These are so good, huge areas, well maintained complete with pit toilets. 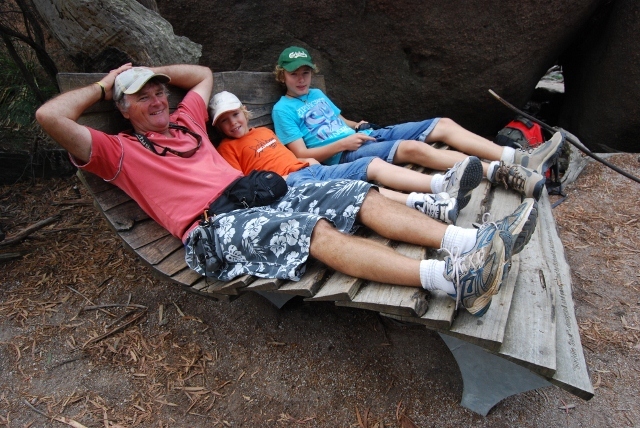 We went to Moulting Bay which is not even 5 minutes from town. We got a great spot that will do us nicely for a few nights. 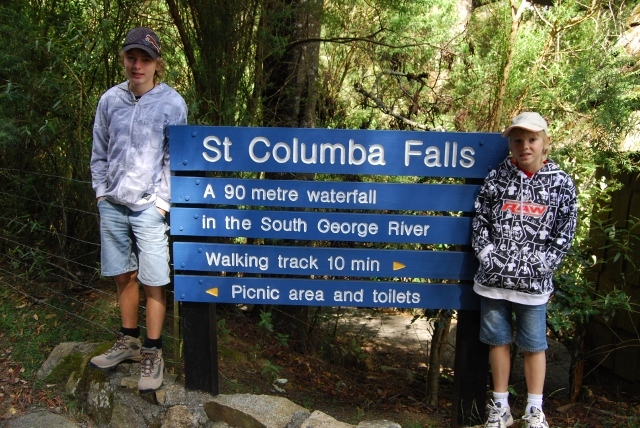 Next day (Monday 21st) we headed off for a short road trip to St. Columba Falls, Halls Falls and the Anchor Stamper. 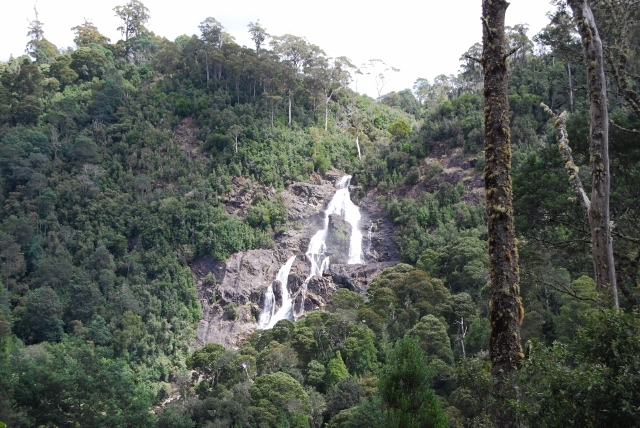 St Columba Falls at 90 metres are the highest falls in Tasmania. 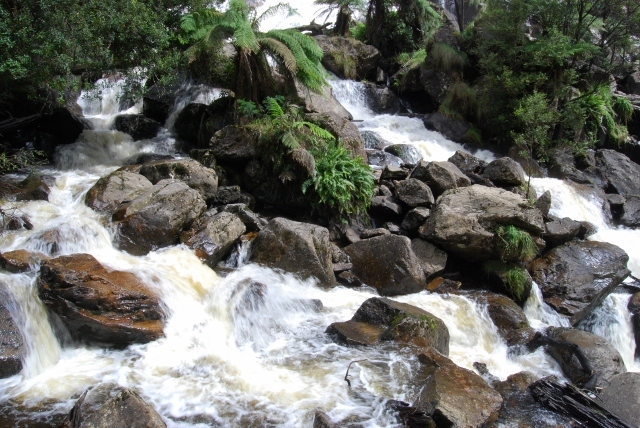 After the Saturday rain the falls were gushing with more force than usual. They were very impressive. 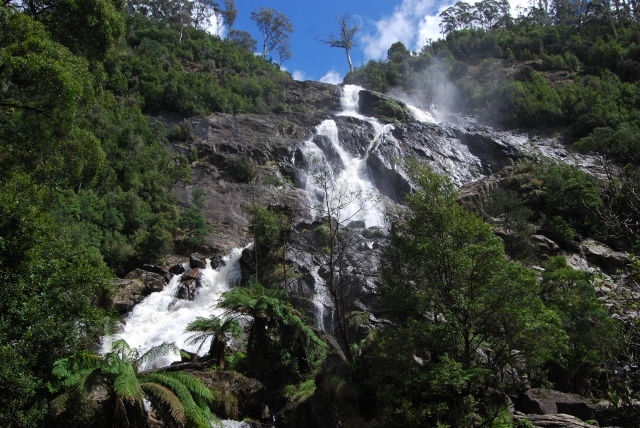 Halls Falls were a longer walk but not as impressive but still worth the effort. 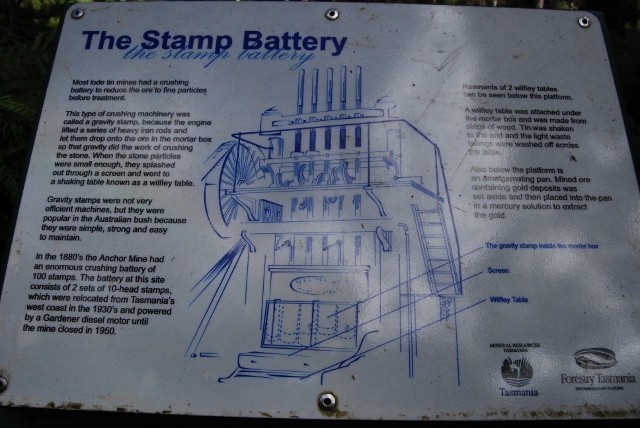 Next just a few kms down the road is the Anchor Stamper. Chris insisted that we see this while the rest of us were less than convinced that this was in fact something we really needed to see. I am only the lowly driver so off to the stamper we went. I hate it when I have to eat humble pie as it was actually very interesting. 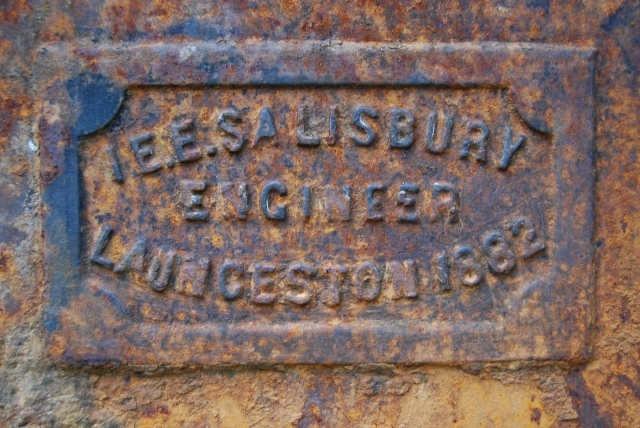 This was an old tin mine that first started in the late 1800's. 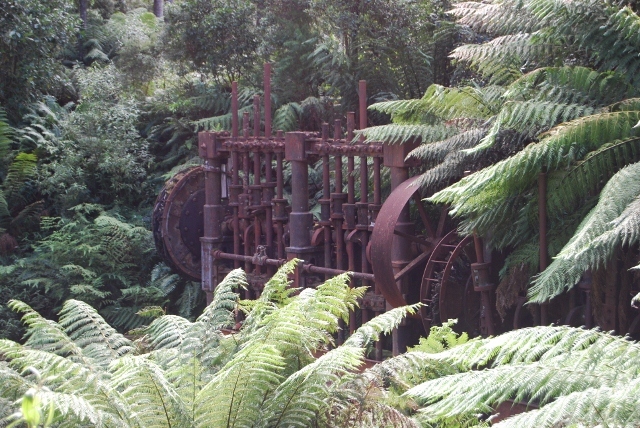 It is now pretty much an overgrown tropical forest with a few remaining relics of this colourful past. The big thing you can see in the pictures above is an old rock crusher that was initially powered by a huge water wheel that required 10 tonne of flowing water to turn it one revolution. Getting enough water to run it was a huge issue and it was eventually powered by a diesel engine. The plant went broke a few times and re-opened until it was finally closed for the last time in 1996. It looked like it had closed a hundred years ago and actually looked like a set fom a Jurassic Park movie. Very interesting indeed and well worth a look (I tried to tell her it was going to be good). 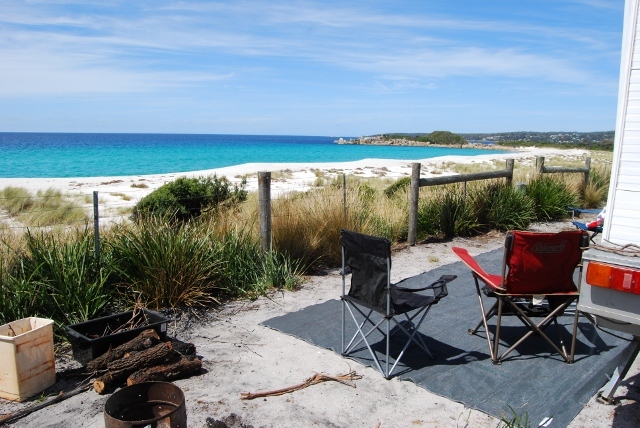 The Bay of Fires - what a campsite. Million dollar view for free. Tuesday up late as it was bloody freezing, we believe around 6C, due to a cold front that had moved in. 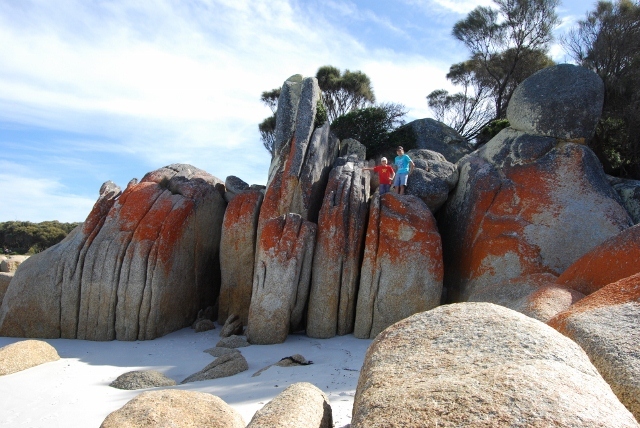 It was a beautiful, sunny, warm day so we planned to do the shops over in St. Helens and then go out to the Bay of Fires and have a look around. 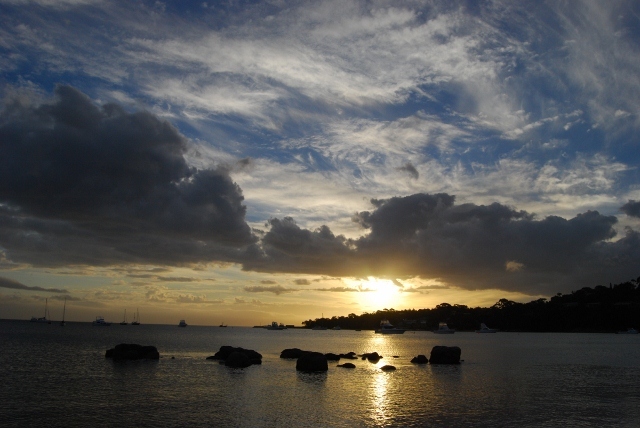 The beaches and associated rock formations here are amazing. 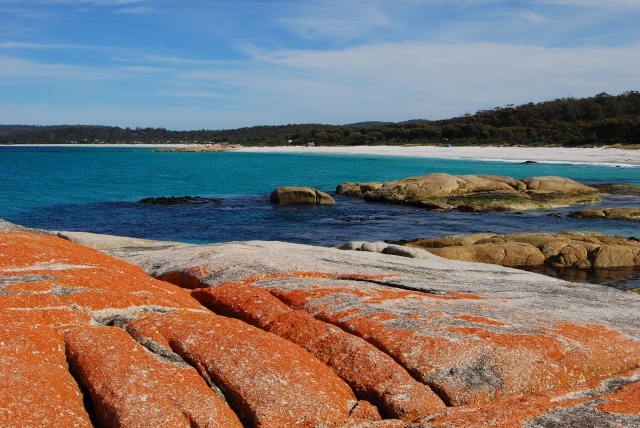 The 'Bay of Fires' was named by an early explorer Captain Furneaux who saw smoke from Aboriginal fires from his boat. We thought it may have been because of the orange colouration (lichen) over the rocks above high water mark (clearly we were wrong). It was around mid-afternoon when we had a look at the second beach, Swimcart Beach. Now this one was special. Huge camping area along the foreshore extending about a km. The sites are large and private, some with million dollar views. We drove around and found what we thought was the best site here, empty. We looked at each other and said, 'Thats ours'. We quickly drove back to the van, collected all our seats and went back to reserve the spot, leaving Alex there to ward off any wannabe campers. We quickly packed up the van and moved the whole 5 kms down the road. This is an amazing place, and it's totally free. 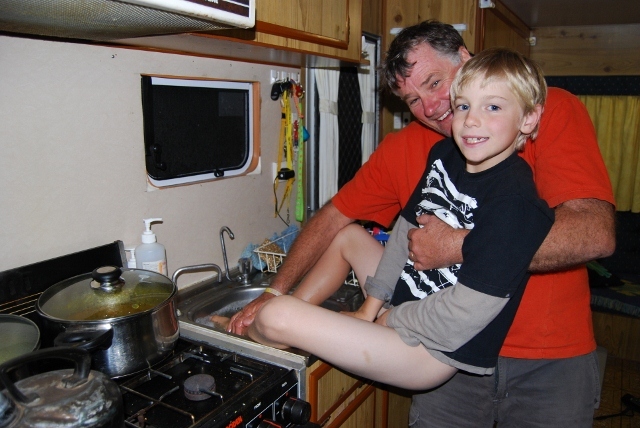 Good on you Tasmania for understanding the worth of having campers in your town. In the few days we have been here we have spent well over $400-00 in groceries, fuel, haircuts and other bits and pieces. Multiply that by the hundreds of free campers along this stretch and a lot of money is coming to town. You seriously do not have to be a rocket scientist to see the benefits. If only the east coast of mainland Aust. had the same mentality, maybe some of the smaller towns may actually prosper instead of doing the exact opposite. We also discovered the other day, purely by accident that the toilet block at the marina in St. Helens has free, very hot showers, so each afternoon, in we went and spend as much time as we liked cleaning all the dirt off. How good is that. Then we discovered another little St. Helens gem. On the road in from all the free camps the council has installed a water filling station. I kid you not. They have widened the road so you can pull in and have two taps so you can fill up your caravan. And guess what, all free. They even widened the other side of the road so you can do a U-turn. It just keeps getting better. 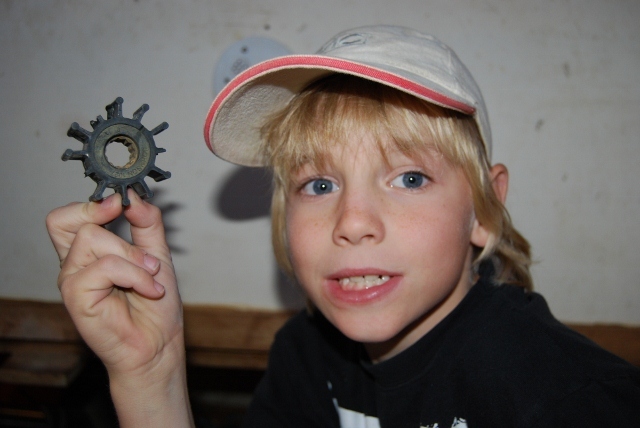 Wednesday we stayed put at our seaside campsite for a day of schoolwork and I did some maintenance. It was a beautiful sunny day and a classroom with the best view in Australia. In the afternoon the wind picked up to gale force and we thought we would be bunkered down for the remainder of the day, but 2 hours later, someone hit the switch and it just stopped, just in time for a nice sunset stroll along the beach. Thursday 24th - As sensational as this place is we do need to move on or we will still be in Tasmania in September. We did some last minute sightseeing out to Binalong Bay and Dora Point campground before heading into St. Helens to fill up with water and all have a hot shower, before moving a little more south. One of the great things about Tassie is that your daily driving is often less than 50 kms so it doesn't matter how late you get away with you still arriving at your destination at a reasonable time. Now here is chalk and cheese. 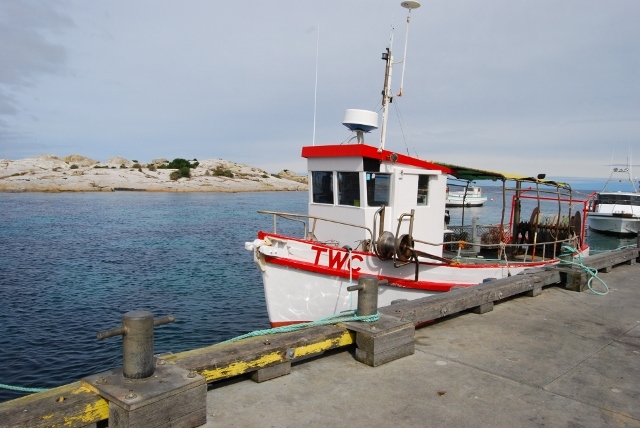 Only 75 kms down the road is Bicheno. I was actually looking forward to seeing this place for some reason, must be the posh name. We arrived mid-afternoon and the first thing we noticed was that there were no caravans or campervans to be seen, and no parking provided for big rigs. As we left St. Helens today after our shower we would have seen 30 or more caravans or campervans, most in the marina carpark. The streets and shops were busy and the place was buzzing. 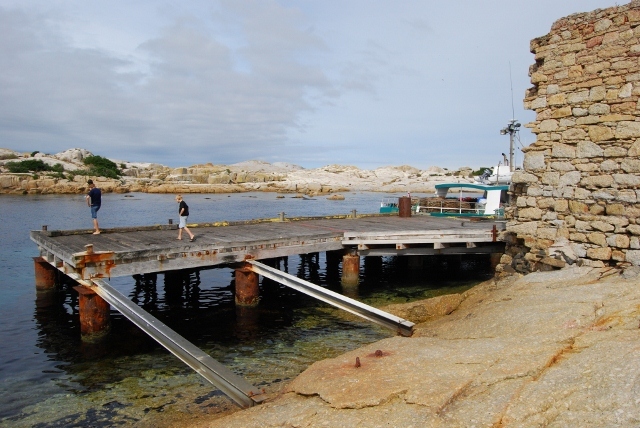 Bicheno - would have been a nice place to stay if they were more friendly. Then we went to the Bicheno Tourist Information Centre to find a very unhelpful woman behind the counter who was more interested in attending to her child than helping me. 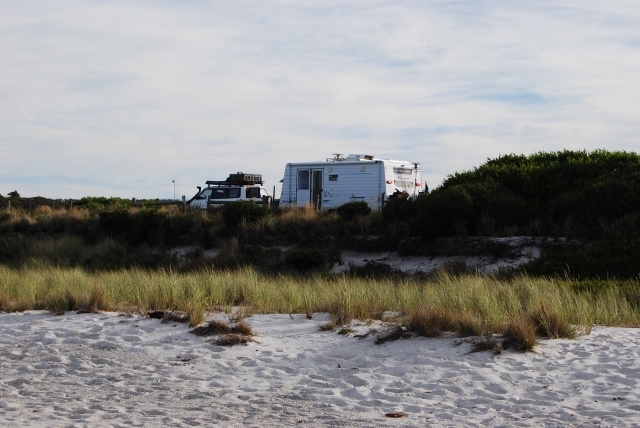 There are no free camping spots at all in Bicheno, in fact there are 'No Camping' signs everywhere. The streets were empty, the carparks empty and I imagine so were the shops. I am guessing that one of the caravan park owners is on the council, in fact I would bet on it. (We're not opposed to caravan parks, but the choice was very limited and unappealing.) 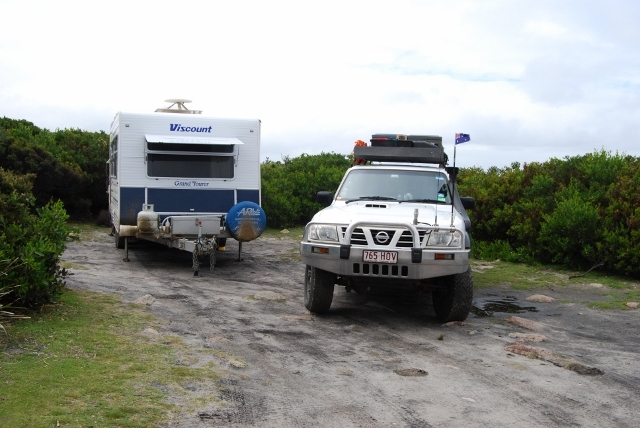 The only option she gave us was a national park about 15 kms away with no campsites but we could camp in the carpark. Now you're spoiling us! 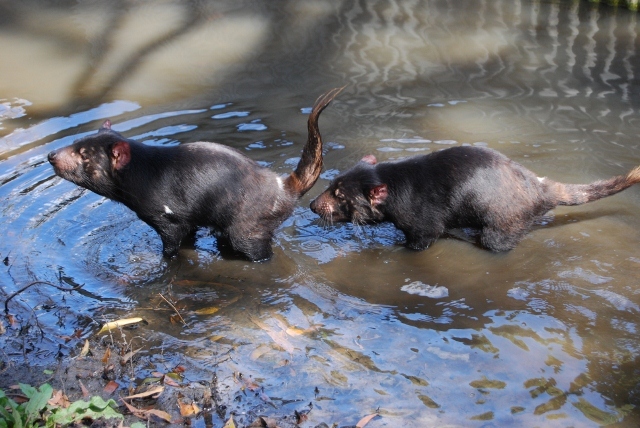 So off to the Douglas Apsley National Park. It was actually rather nice and we found a good spot in the carpark. We were the only people there. What an amazing difference! I would estimate that in all the free camps close to St. Helens there would be well over 300 campers. 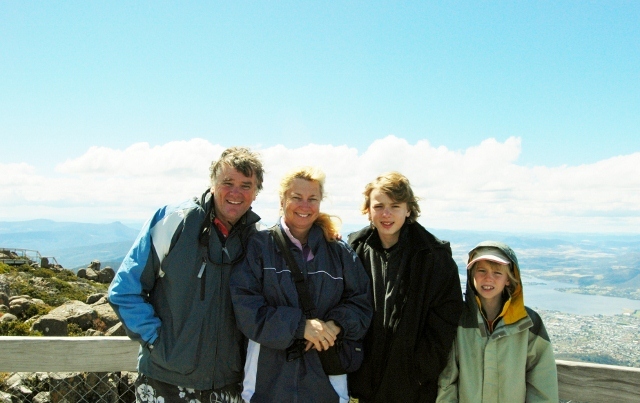 In Bicheno, just us. What must that be doing to the economy of this town. My advice, skip Bicheno, have a look around but move on. I don't think they like trailer trash. They must be too posh!!! 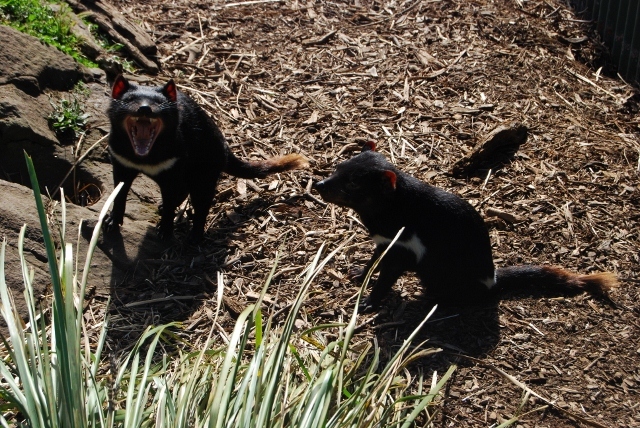 Friday 25th - we had planned to go to a nature park today as Harry is desperate to see a Tasmanian Devil. Well unfortunately it was raining when we woke so that was off the agenda. To be honest I was actually happy as I had had a terrible night's sleep. Maybe it was because we were miles from nowhere in the middle of the bush totally on our own. I did wake up about midnight when a car drove in and drove out. Why would you do that in the middle of the night? I mentioned in the morning that I had heard this car and why would someone drive all the way out here at that time of night? Harry pipes up - 'Ivan Malat'. Where the hell did he get that from? We all laughed, kind of!!!!! We packed up and headed to Bicheno to go to the laundromat, get water and get a few groceries. My opinion of this town has not changed but the little local laundromat is sensational. Fully staffed with ladies who will actually put your washing on for you and then throw it in the dryer for no extra charge. Maybe they should run for Mayor. The town might actually progress. 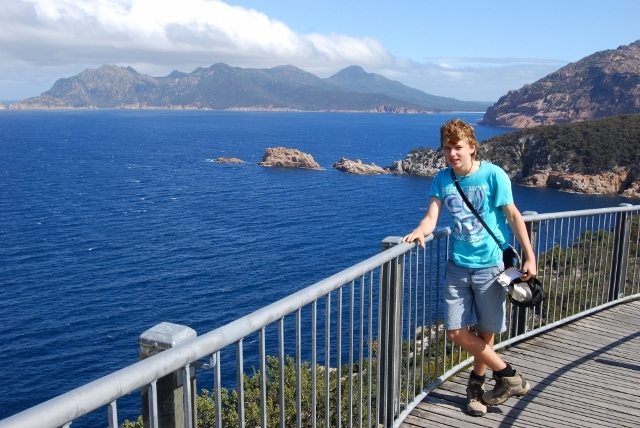 After our domestic morning it was off to Freycinet National Park and to the Friendly Beaches (north campground). It is only 25 kms from that town I refuse to ever mention again and is a great spot right on the beach, good dunnies and nice private campsites. All the books say it is only for small rigs but that is a load of 'Old Cobblers'. Plenty of room, don't believe the book. I think I can see it!! Saturday 26th we woke to a beautiful sunny day so off to East Coast Natureworld. This place gets good write-ups and although a little daggy and in need of a few bucks being spent on it (and it is for sale) we had a great day. 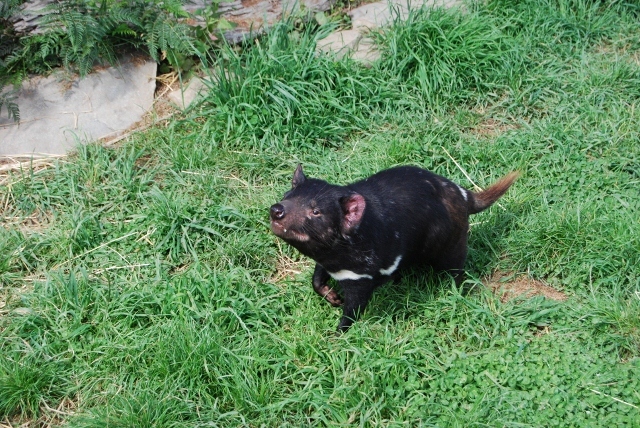 They have plenty of Tassie Devils that we were able to get very up-close and personal with. We witnessed their daily feeding and realised Harry is not the messiest eater around. These guys have absolutely no table manners and carry on like a bunch of adolescents at a party. They bite, snarl and attack each other as it is every devil for itself. 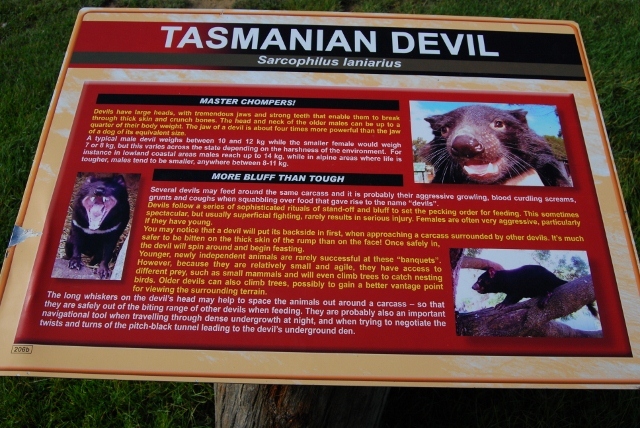 They have an active breeding program (as do most of the nature parks around the state) which is very important for the ongoing existence of the devil as the ones in the wild are slowly being wiped out by a viral cancer that is passed on by saliva called Devil Facial Tumor Disease (DFTD). For further info on DFTD click here . 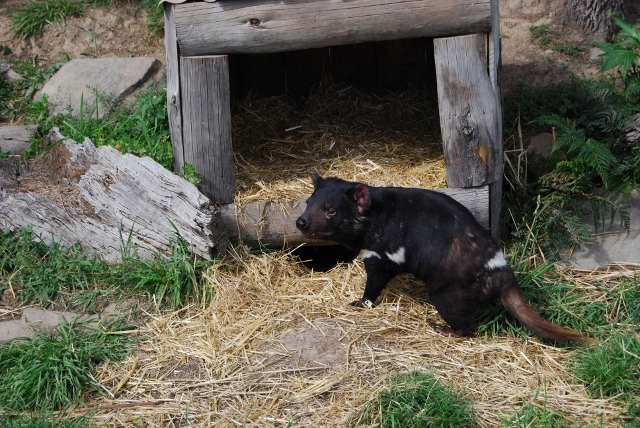 This is a nasty disease that they believe will eventually kill off all the devils in the wild. The virus only lives in living devils and not in dead tissue, bone or hair. It is thought that when all the devils in the wild die out, so will the disease. 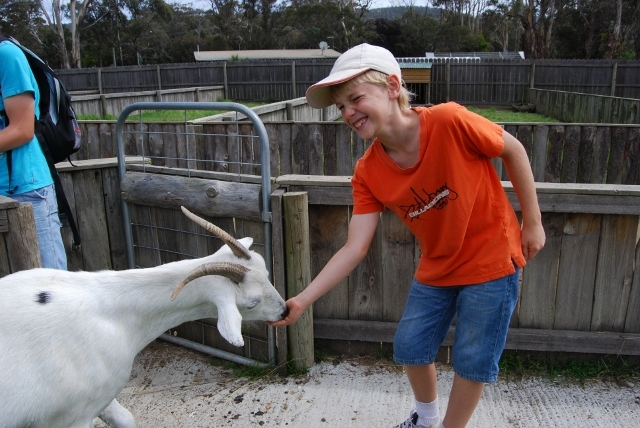 Then the plan would be to re-populate with disease free stock from nature parks around the state. It all sounds very grim. The only other hope is that the devils start to develop some immunity to the virus-causing cancer but that is not happening so far. 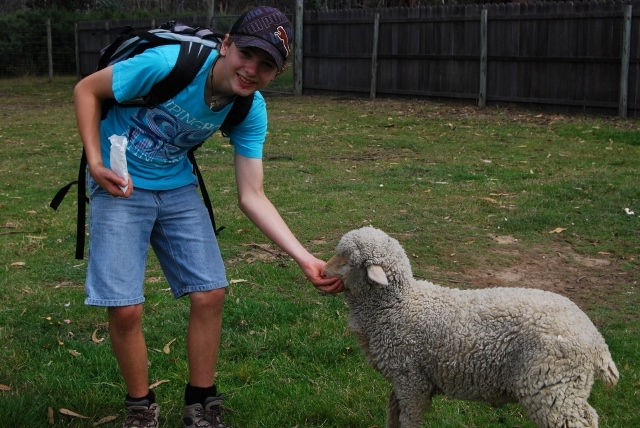 The nature park also had plenty of other animals that kept us amused for most of the day. Friendlies Beach - why do our feet get so dirty?? And yes we had showered! 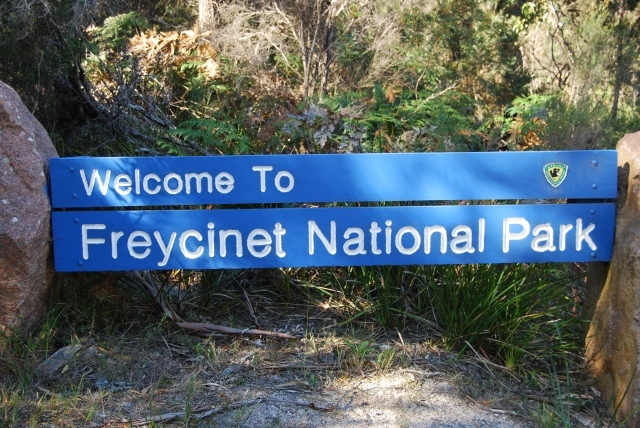 Sunday we had a lazy morning, packed up and moved a few kms down the road to the Freycinet National Park campground. We have been looking foward to coming here as they have hot showers, running water and power all for $16-00 a night. As it has been so cool we have been on occasions only having a shower every second night. By the time evening comes around you are really keen to get under that water. We originally booked for two nights and then extended for another three. That will give us a nice balance of sightseeing and a bit of schoolwork, downloading videos and catching up on some video type work, like this webpage. 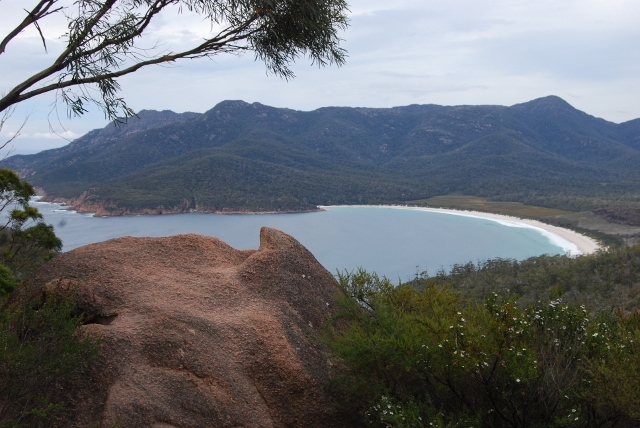 We arrived before lunch, set up and as it was sunny, sunny, sunny we decided to walk back up to the lookout over Wineglass Bay to see it in a different light. It was nice and bright and did look a bit different. 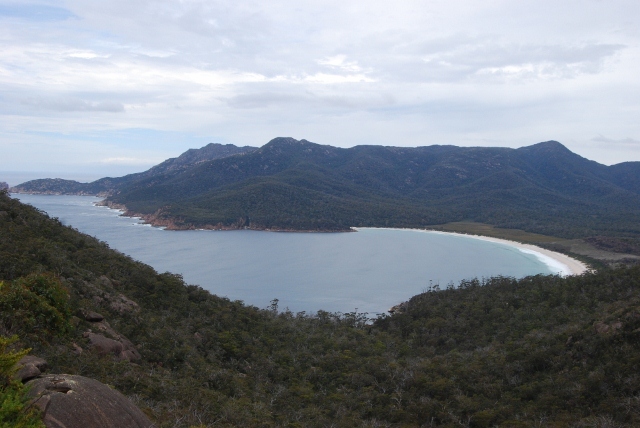 We then did the short boardwalk around Cape Tourville which is perched on the edge of a very high cliff overlooking the entrance to Wineglass Bay. 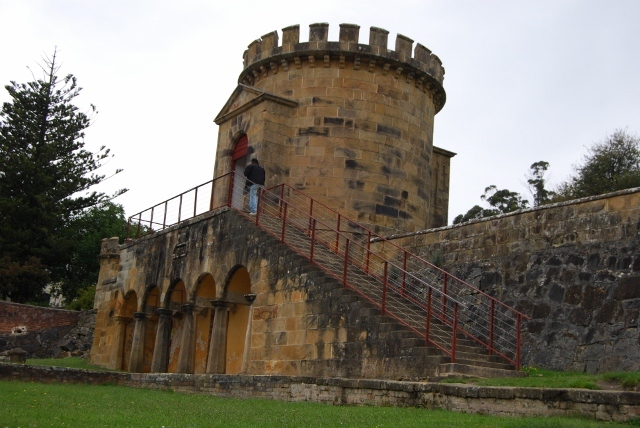 You also walk up to the lighthouse and then it's a short walk back to the car. The boys worked really hard on their schoolwork while we were there and have completely caught up. That was quite an effort as Alex only received half of his books last week and is still waiting on one more, and we are now into week 6 of the school year. Keeping up with the work rate guide should be easy now. 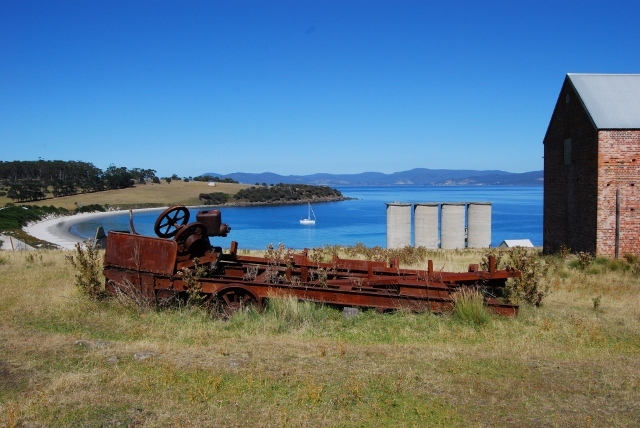 We did a few other drives to Bluestone Bay and Sleepy Bay. 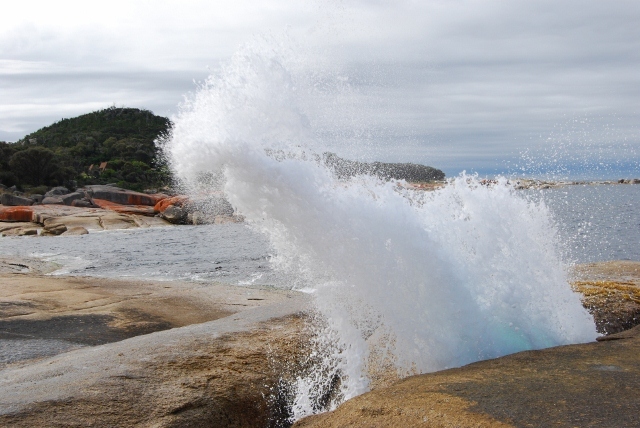 Sleepy Bay, which is on the way to Cape Tourville is very much worthy of a visit. We also had afternoon tea at Freycinet Lodge which is in the national park. This is a private resort that looks very nice, has great views, a couple of dining options, one of which is a well priced bistro and a great bar with open fires. It is nice to actually have an accommodation option within a national park, other than a tent. So that is it for February. We have been very busy and will be getting even more so. We had planned not to book our return boat trip back to the mainland but the boat is booking out fast. 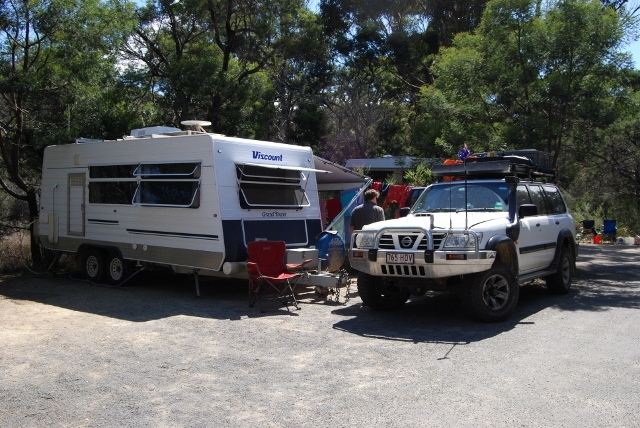 If you just have a car and camper or wind-up Jayco (less than 2.1 metres high), you can go any day of the week. If you are long and high as we are (over 2.1 metres high), your options are limited. I rang the Spirit of Tasmania office in Devonport and she strongly suggested that we book a date or we may miss out and be stuck here. 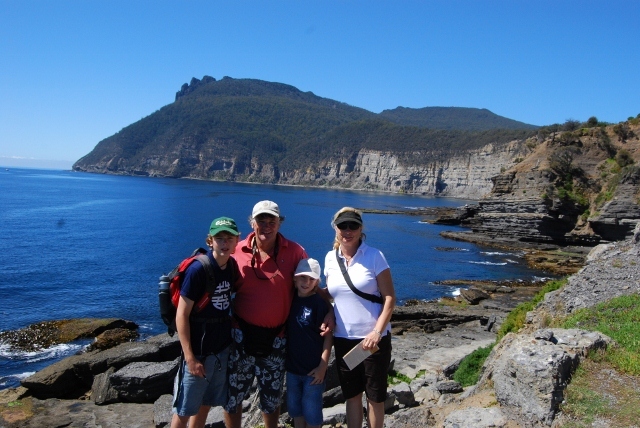 April is busy due to Easter and the school holidays and May is even busier because all the Tasmanians head north away from the cold. So book we did for the 2nd May which will give us exactly 12 weeks in Tassie. While that may sound like a long time, there is a lot to see. We are thinking by then the cold will drive us out anyway. So now we have a timeline. That all sounds a bit 'normal' to me, can't have too much of that in our lives. One more thing. 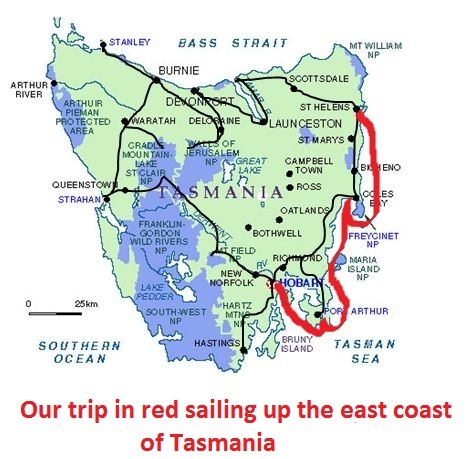 You may remember from the January update I mentioned those four guys from NSW who were kayaking down the west coast of Tassie from Devonport to Hobart. Well, they all made it with no major dramas. They ended up only making it to Cockle Creek which is very close to Hobart as they were running out of time. They were paddling for just over 28 days. An amazing effort and a great personal achievement. Congratulations guys! 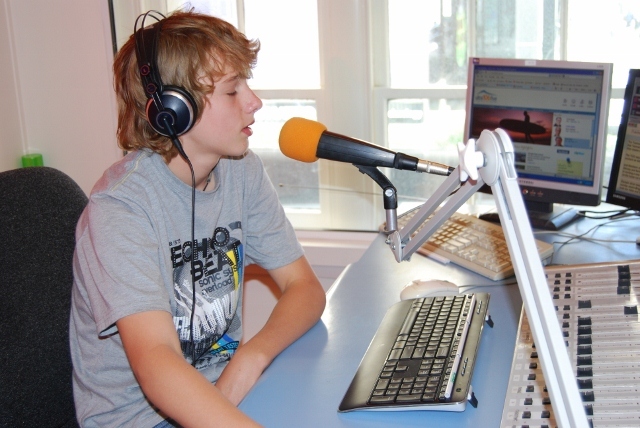 Another 'Harry Moment' - Harry was doing his schoolwork the other day and was working his little guts out. Chris asked why all of a sudden he was working so well. His response - 'Because I don't want to go home.' Now there's a boy after my own heart.